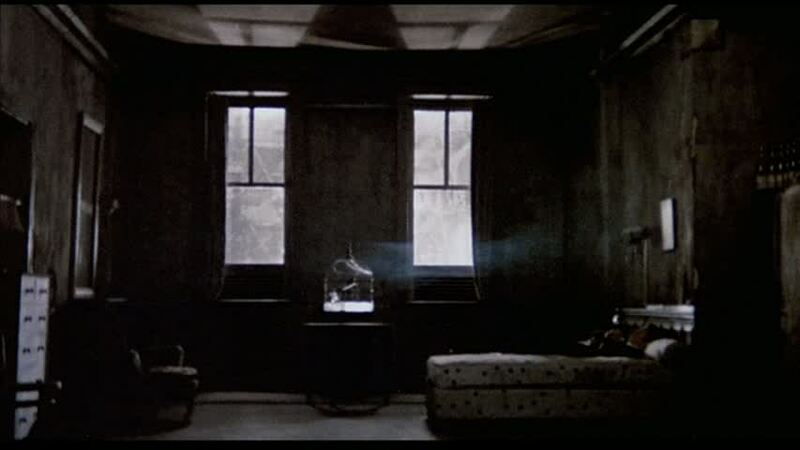 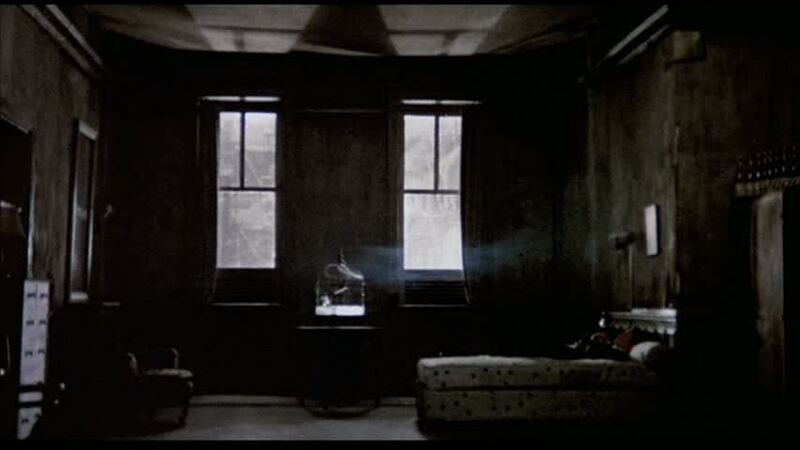 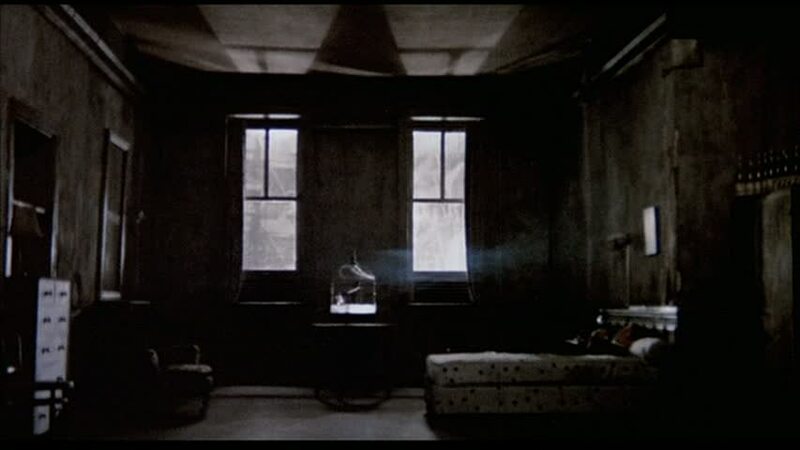 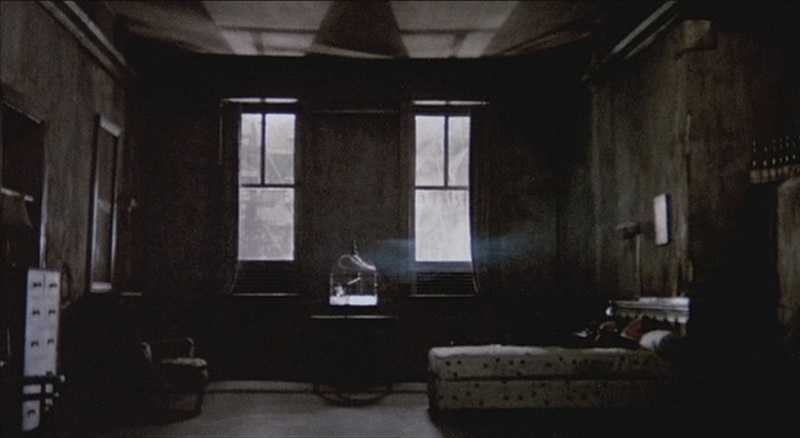 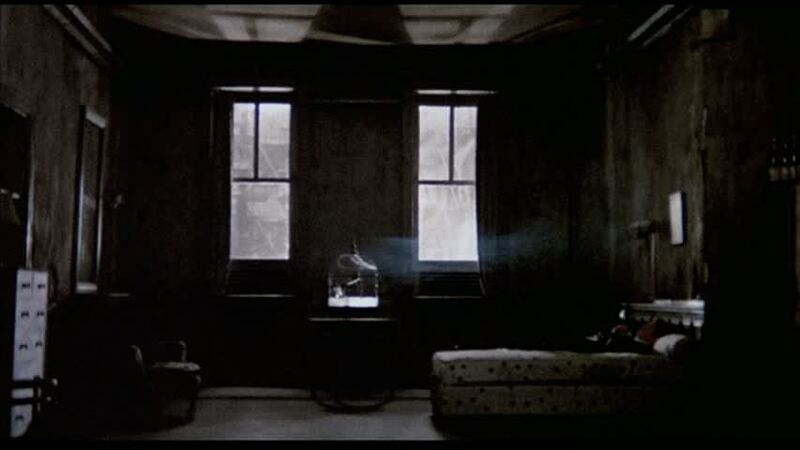 Note also the projection onto the interior's ceiling of shadows from passing traffic outside, and the presence of the rain both as sound heard within the room and as image seen beyond the window. 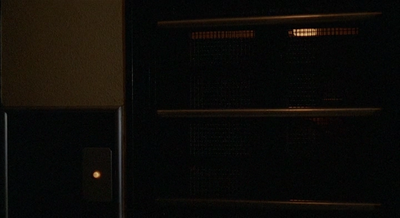 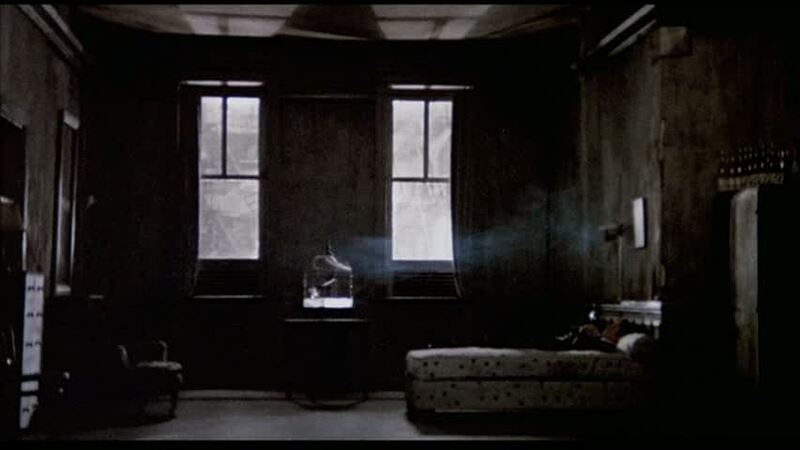 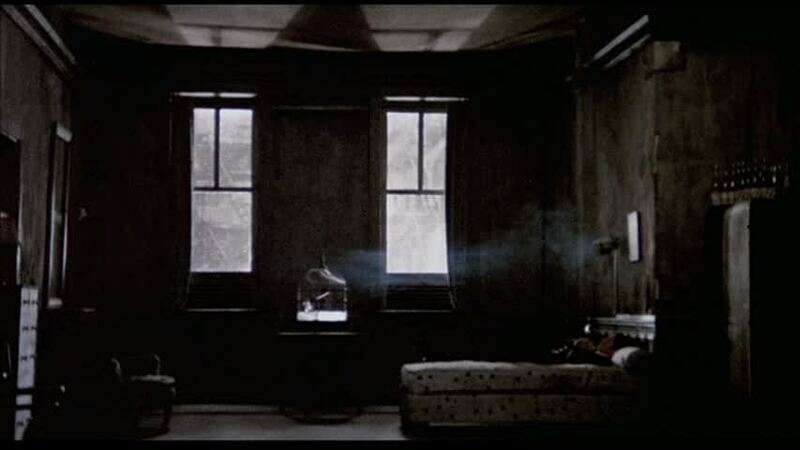 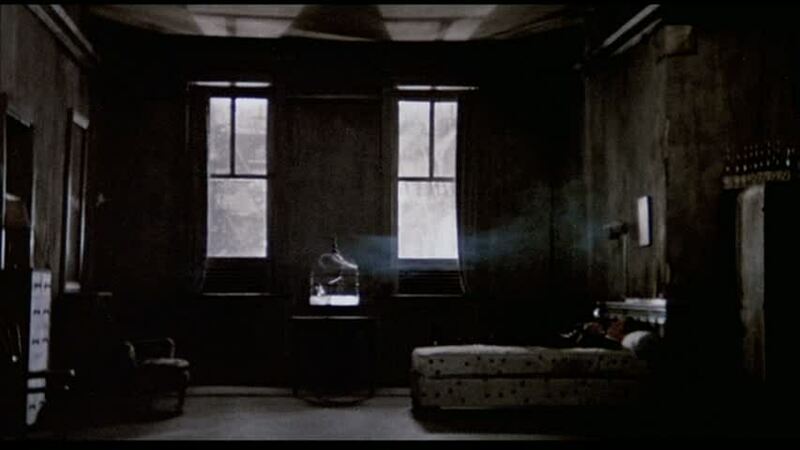 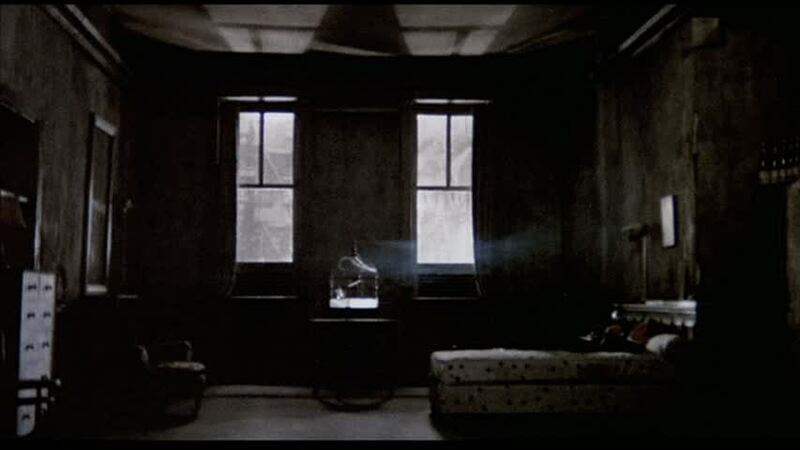 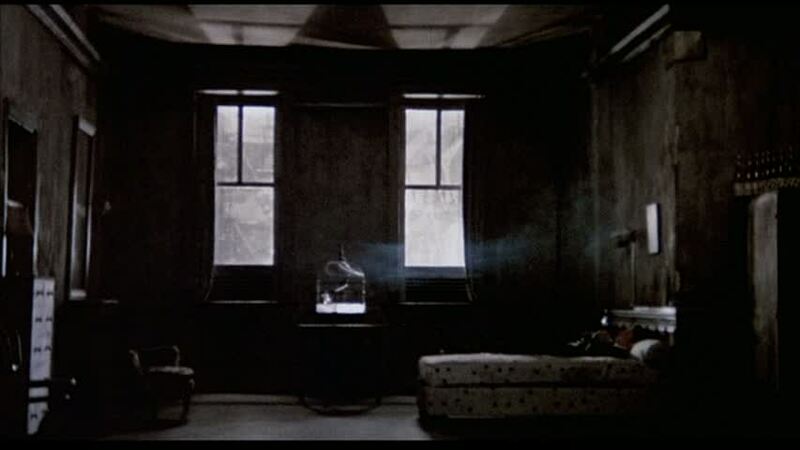 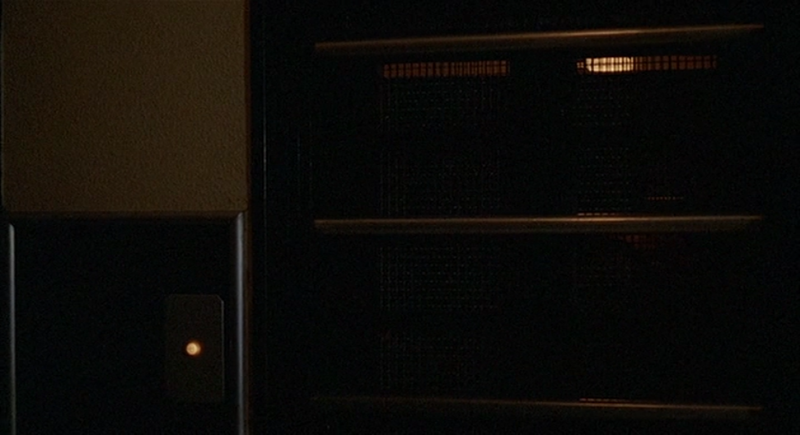 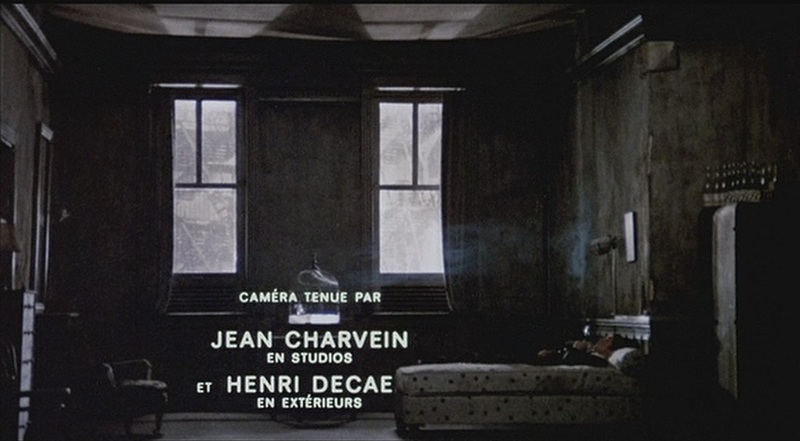 The relation between inside and outside in this opening is not just a matter of cinematographic contrasts. 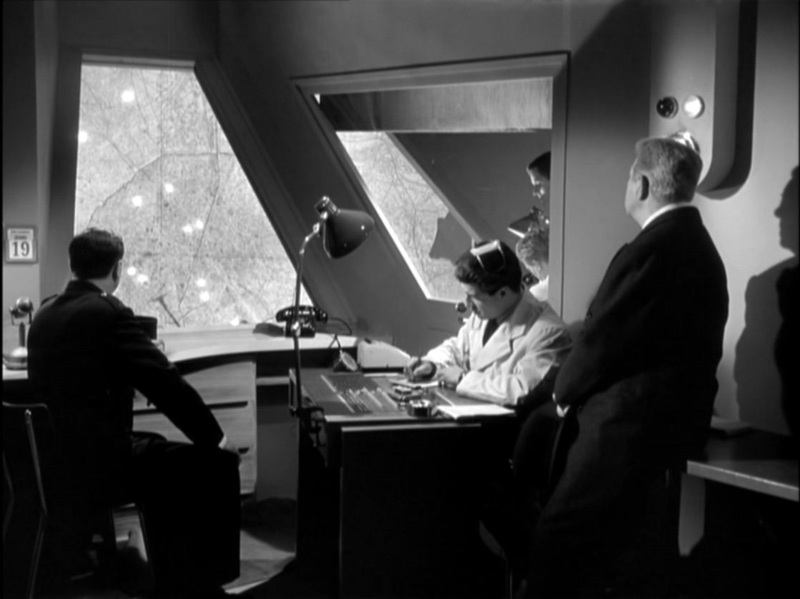 It informs also how we read the topography of the film. 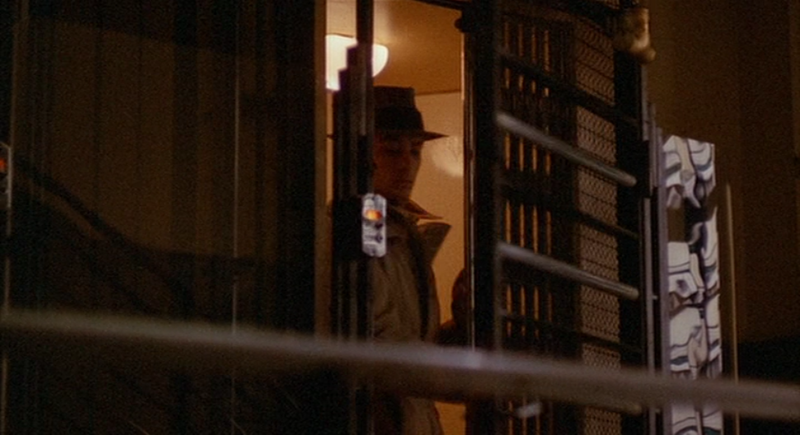 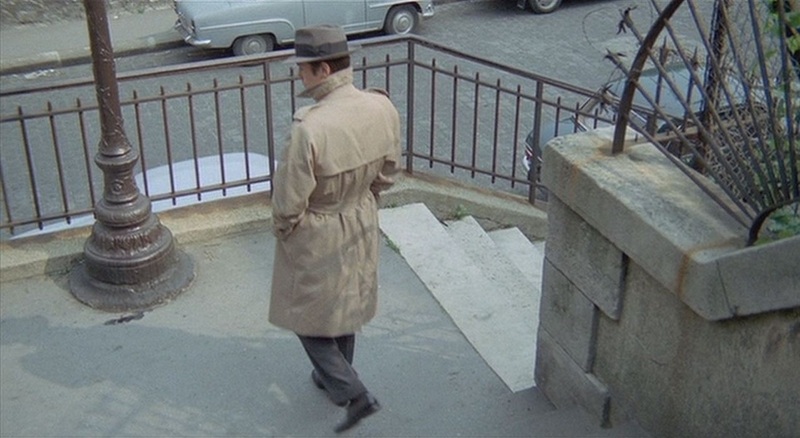 Jef (Alain Delon) emerges from his apartment building onto the street outside. 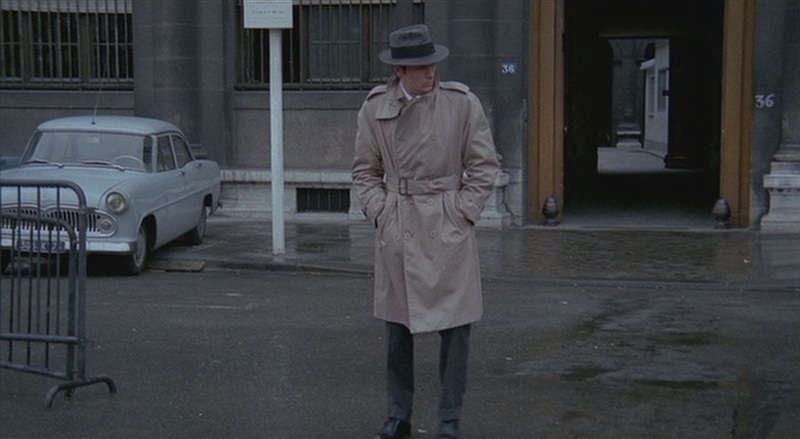 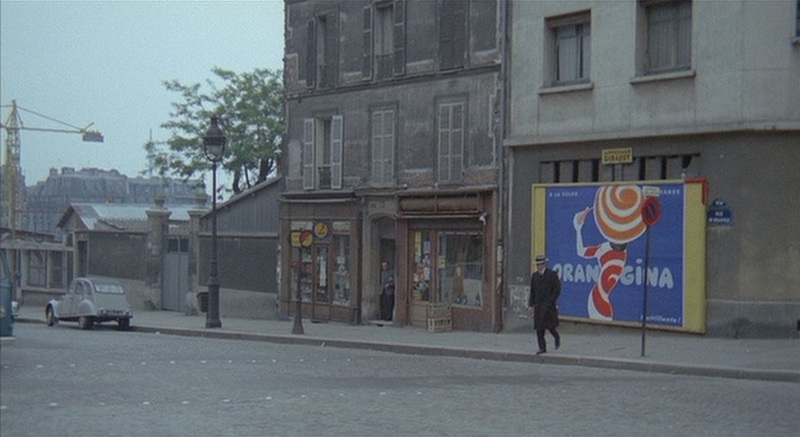 Continuity of time is established by sound (the persistent rain), editing (a clean cut rather than a dissolve) and mise-en-scène (Jef's appearance in the street is as it was in the apartment). 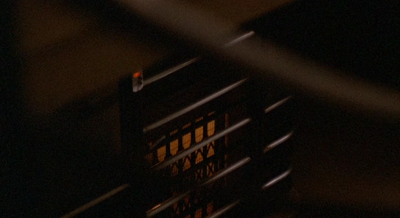 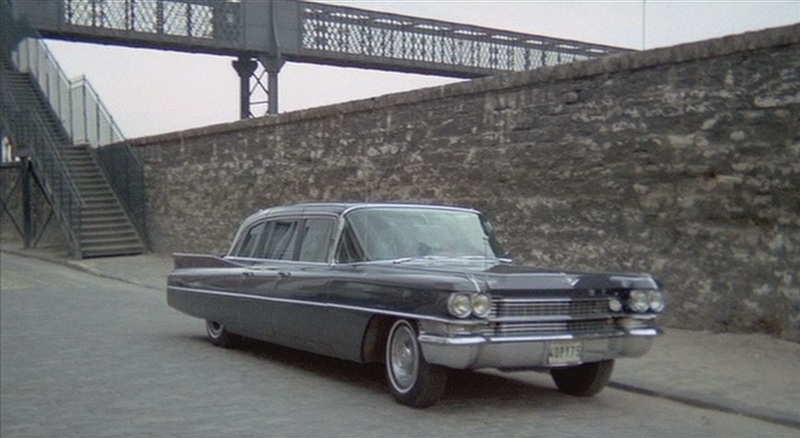 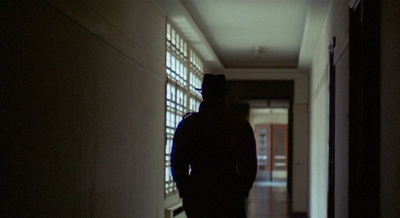 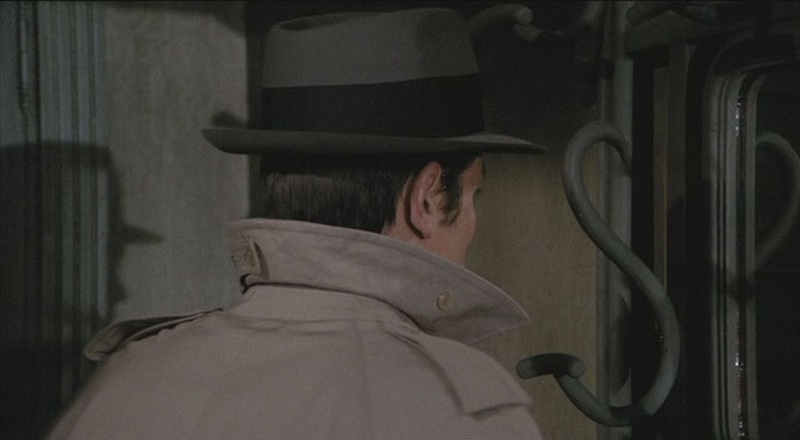 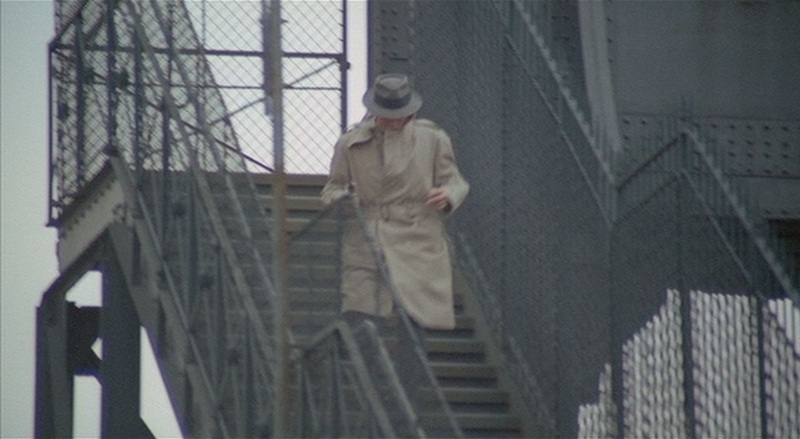 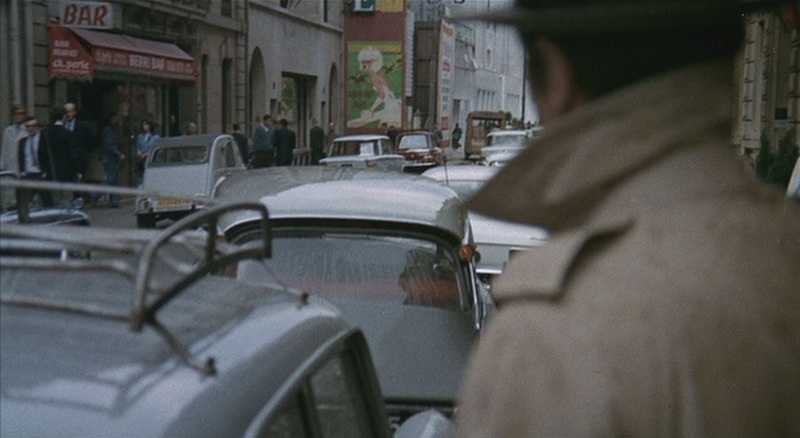 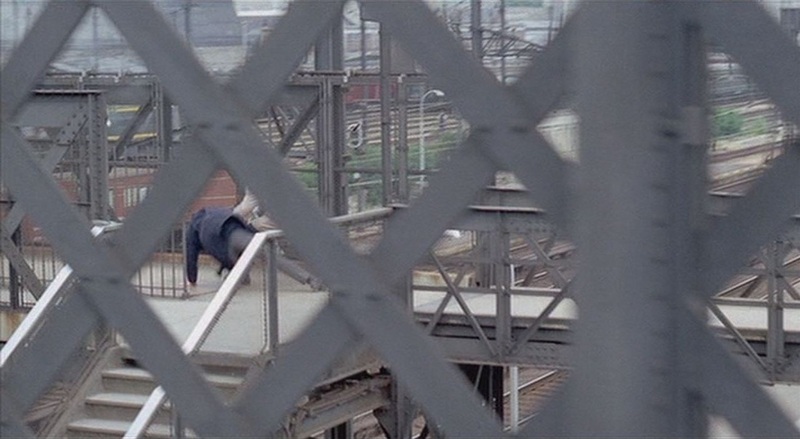 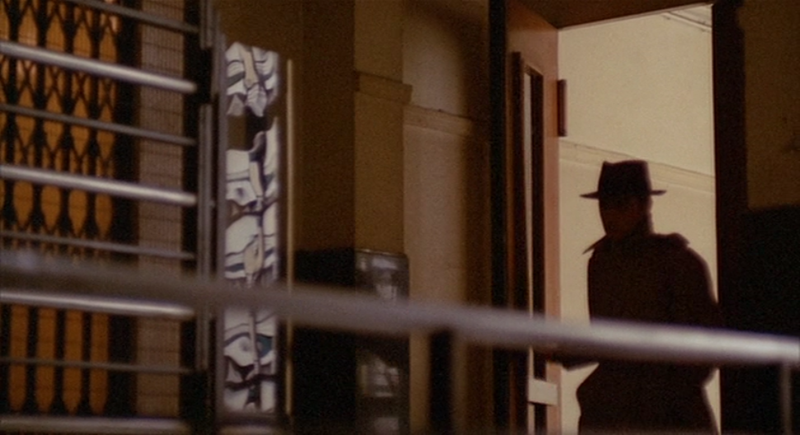 From this leap across the city we may conclude that Le Samourai is not particularly concerned with continuity of place. 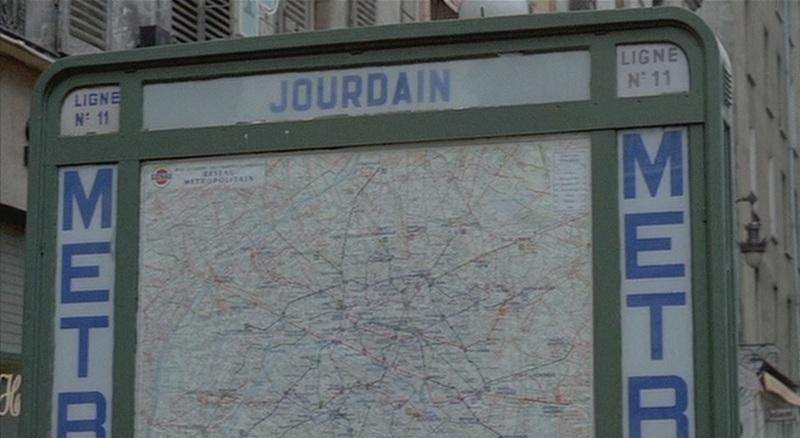 We cannot have assumed that straightway, however, since in this opening the exact location of Jef's building had not been signalled. 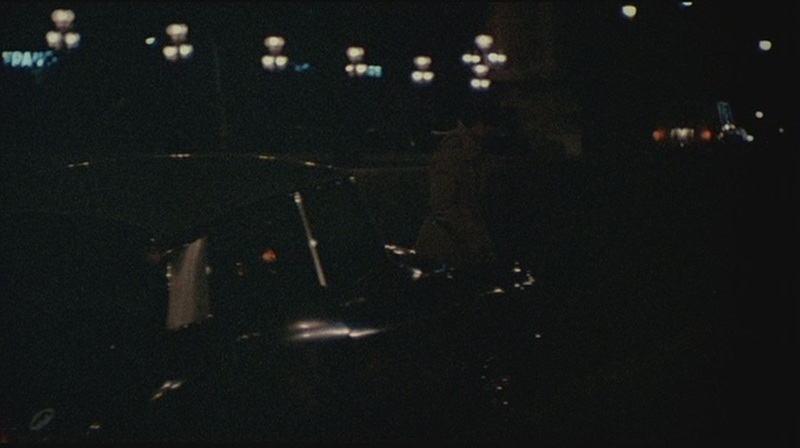 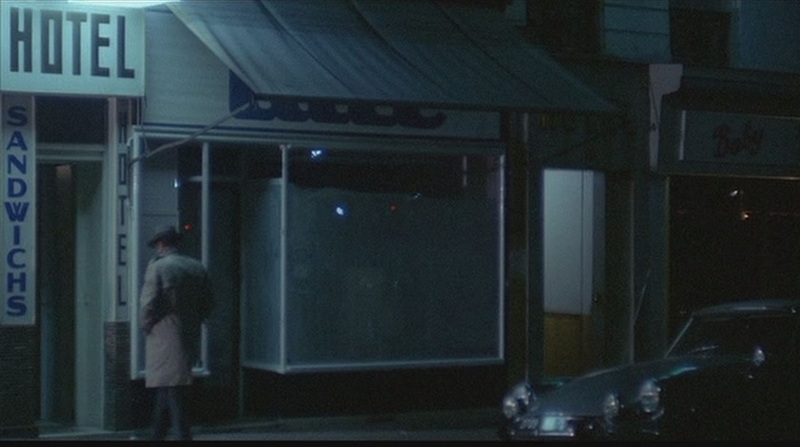 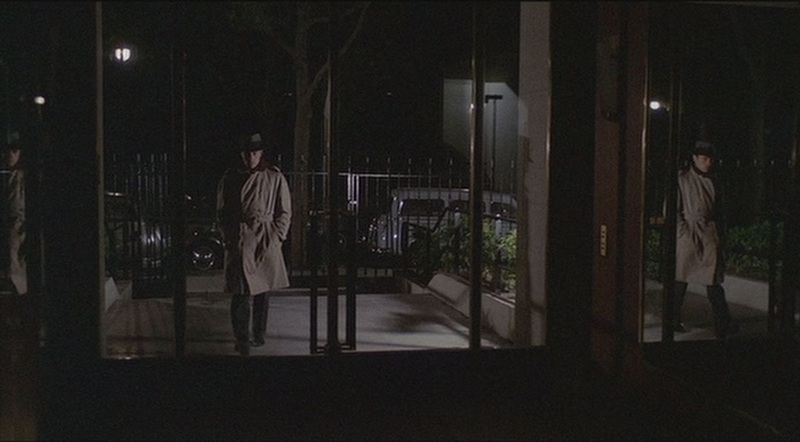 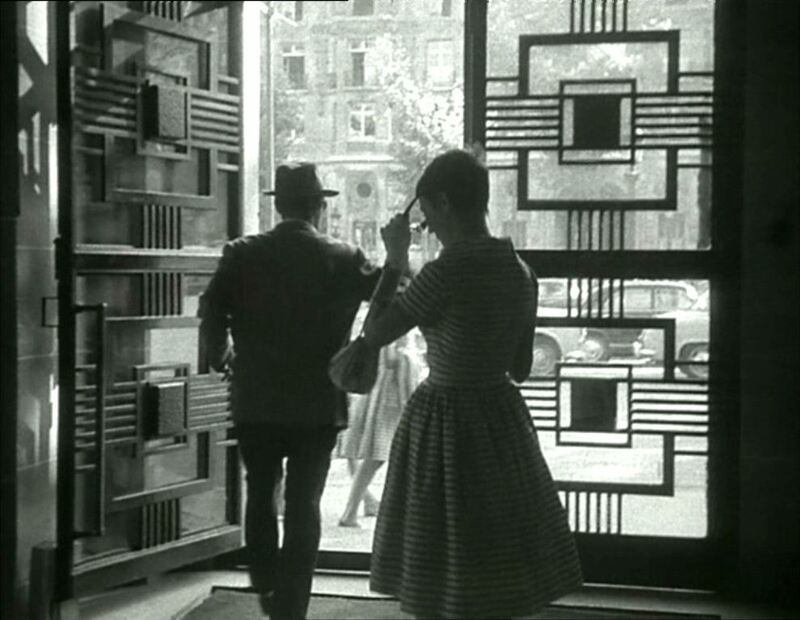 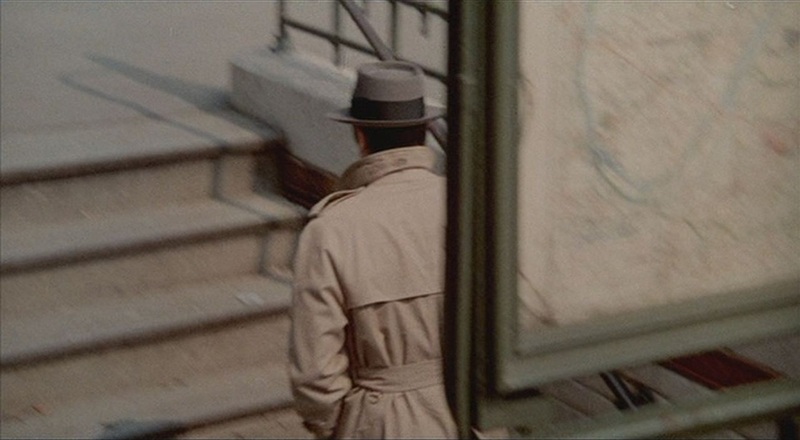 That only happens little by little, with recurrent shots of the exterior at night or dawn, but with no topographic detail provided until a late sequence where Jef is shown leaving his apartment, crossing the rue de Belleville and taking the métro at Télégraphe. 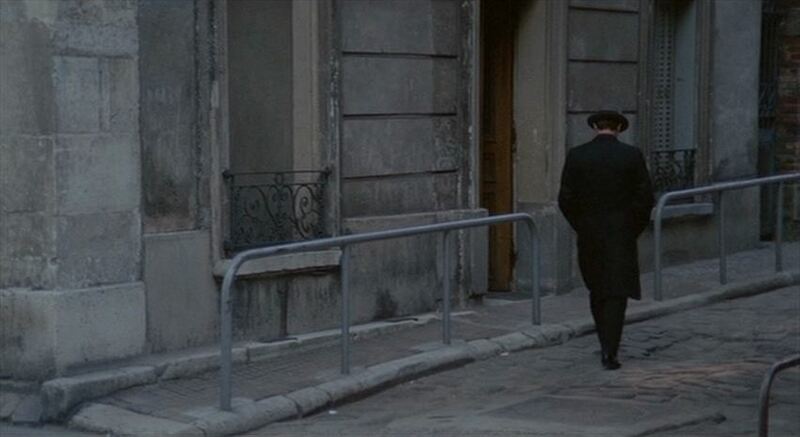 At that point only can we wonder how he came to be on the rue de Berri, across the city, when first he left that same apartment. 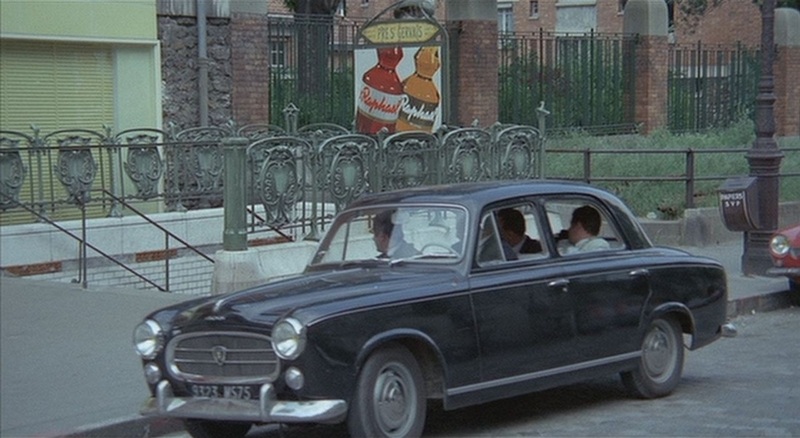 But that would depend, of course, on our noting the Berri Bar across the road when he first leaves his building, and remembering what we had noted more than an hour later. 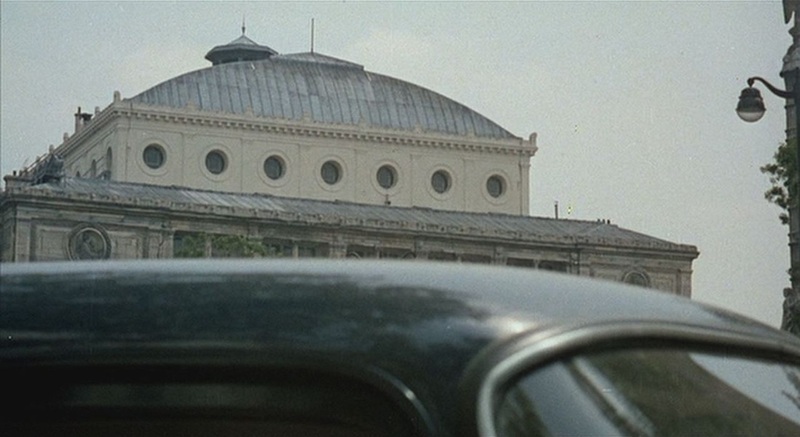 This topographic aporia (a type of topotrope - my neologism) only does its work on a second viewing, when we have discovered how precise the film can be about where it is in place, and also in time (noting the recurrent titles that mark the time, day and date of the action). 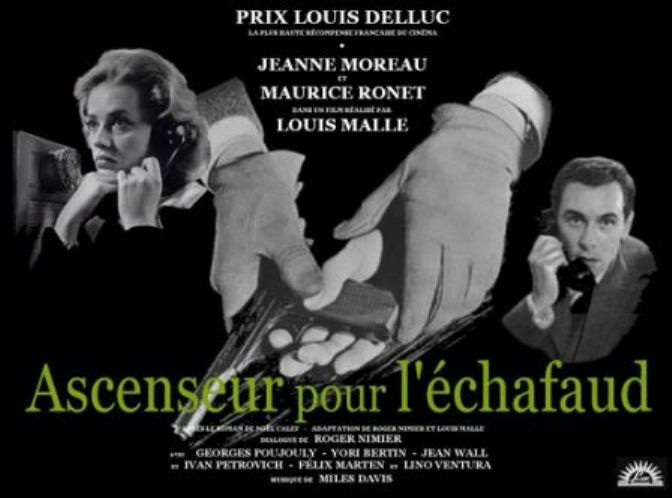 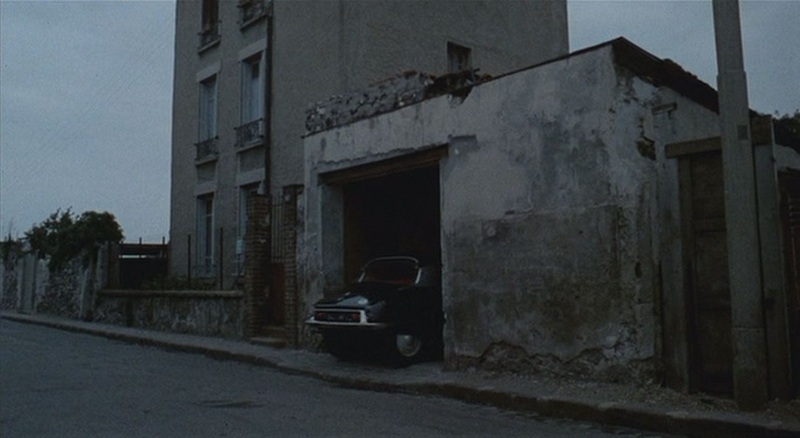 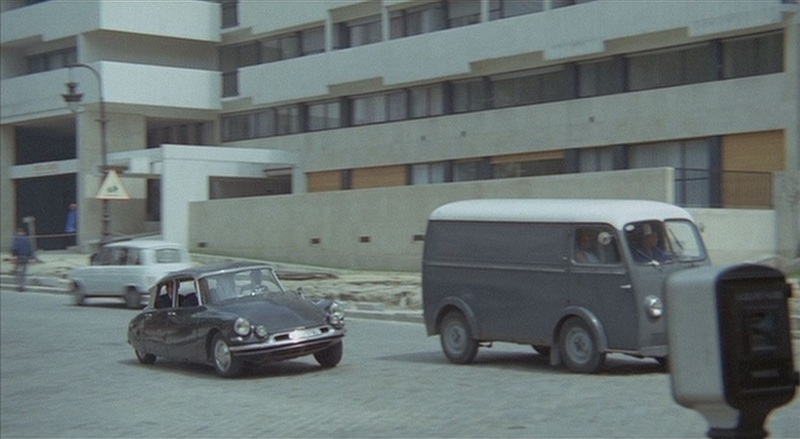 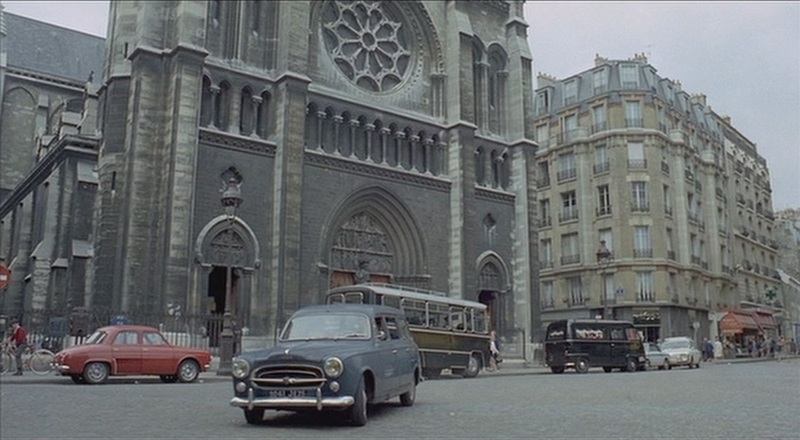 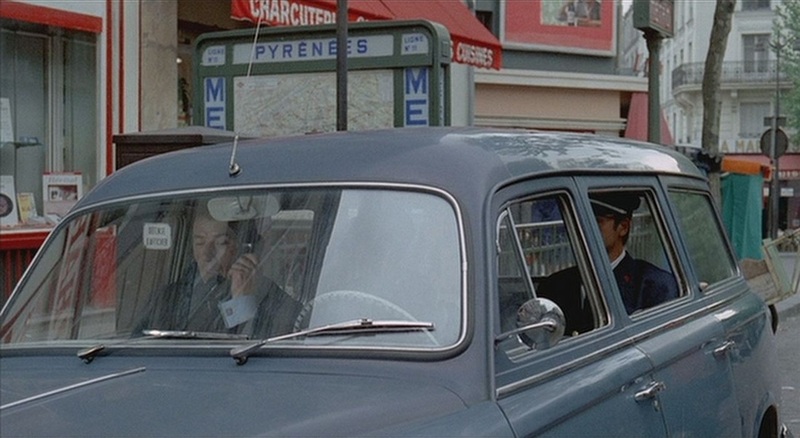 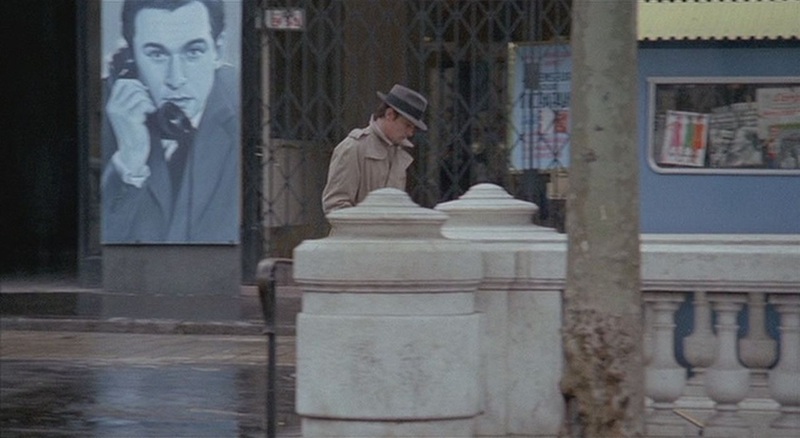 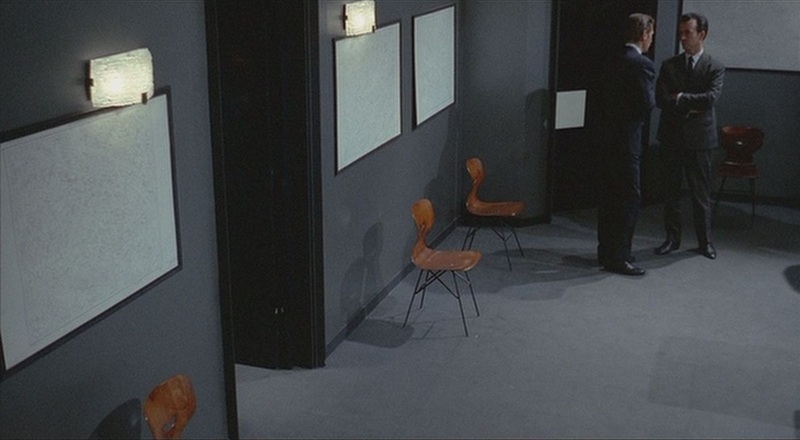 The recurring locales of Le Samourai give its topography an east-west spread, with Jef’s apartment to the east (1, impasse des Rigaunes, 19e - above) and, to the west, the apartment of his girlfriend (11, boulevard de l’Amiral Bruix, 16e). 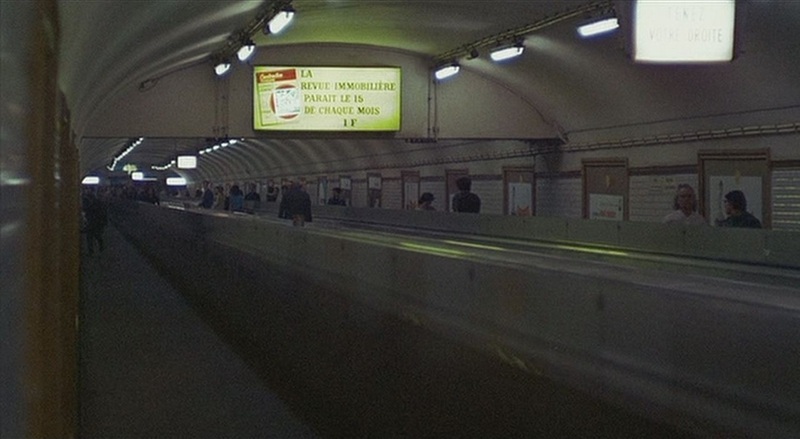 a/ the métro itself, an underground arrangement of tunnels, corridors, foyers and staircases, with its distinctive furnishings, décor and signage, and as defining feature the regular coming and going of trains. 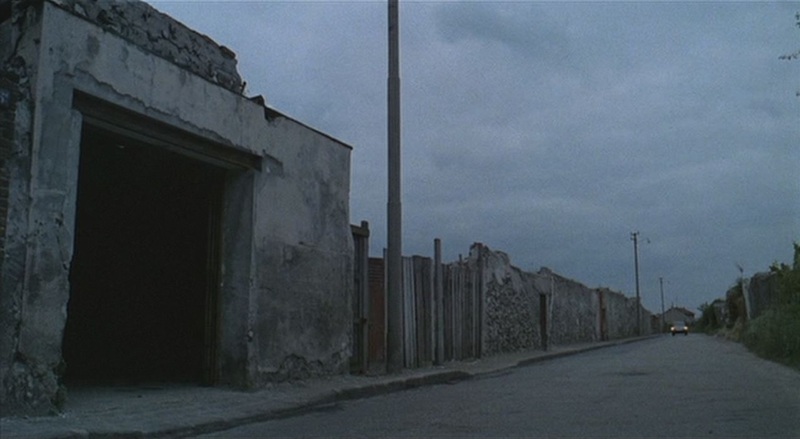 We are told that Jef knows this world 'like he knows his own pockets', though really the knowledge he demonstrates is little more than what the average habitual user of the system would know. 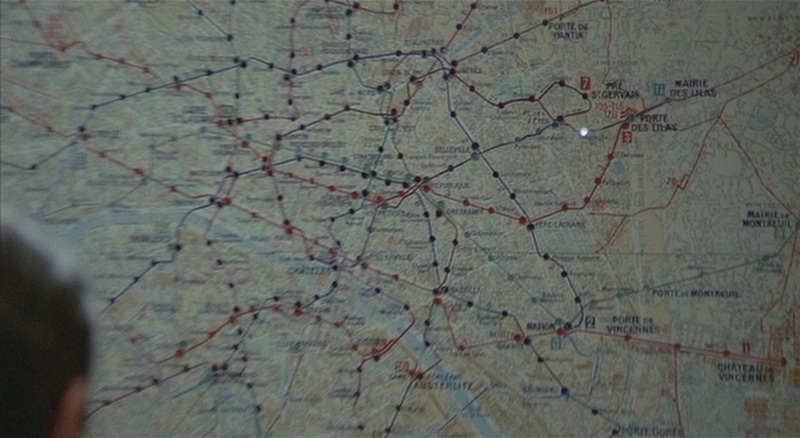 Anyone with the ability to read any one of the many maps that are everywhere in and around the métro can find their way around it, and if we don't see Jef consult one of these maps - indeed if he appears to studiously ignore them - that only means that he knows where he is going and how to get there. 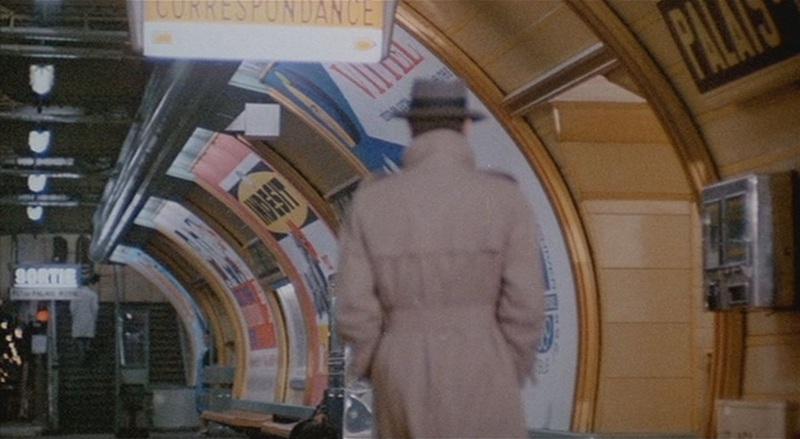 But what they chiefly show is the city refigured in terms of the schematic simulacrum below ground. 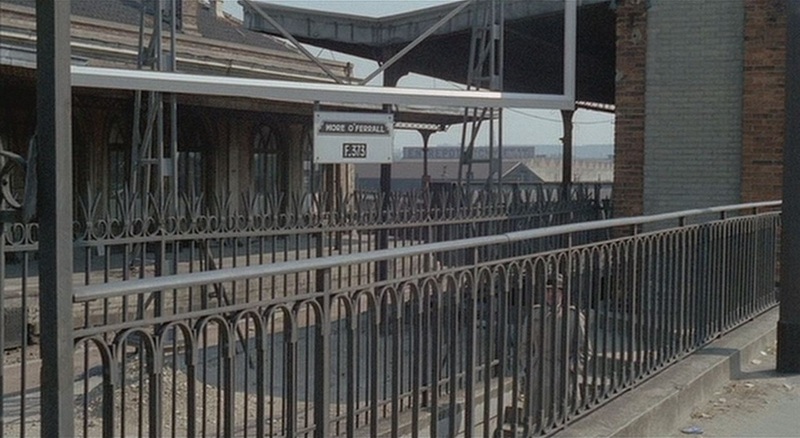 The one-word station names, especially, are reductions of the locale to a convenience (saving space and time). 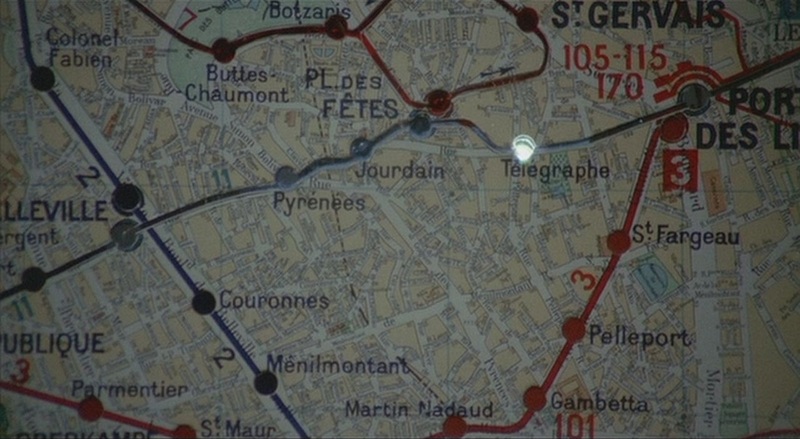 The 'rue du Télégraphe' invites inquiry into the origins of its name (see here for a brief account, in French); 'Télégraphe', on the other hand, is, well, telegraphic, it's just a name. 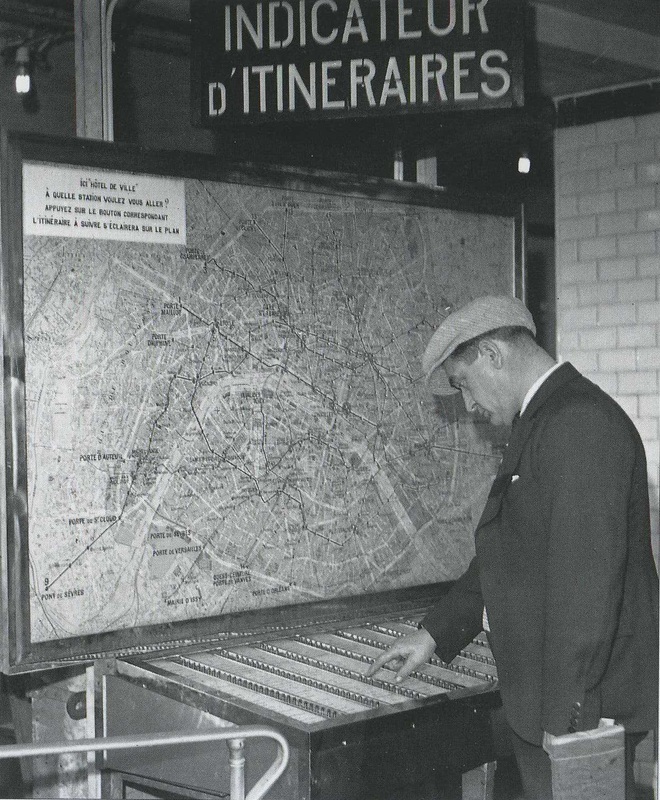 The relation between station names and street names is generally symbiotic, but the métro's tightening hold on the city's nomenclature is a discernible phenomenon since the first line opened in 1900. 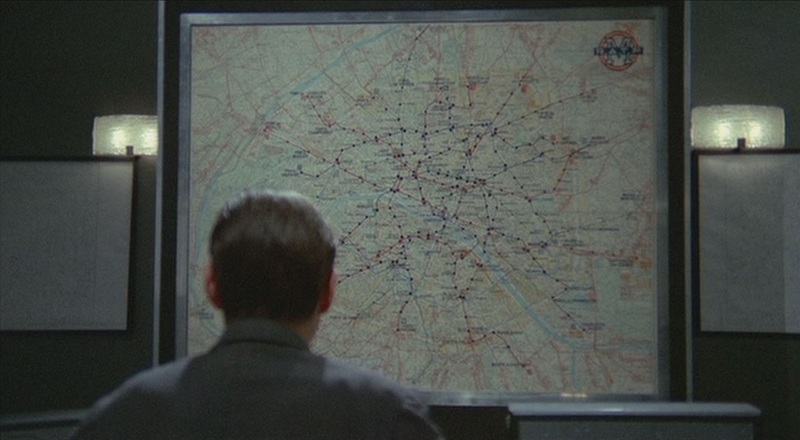 The Chief Inspector's overview might suggest that he has at his disposal a superior knowledge of the métro system. 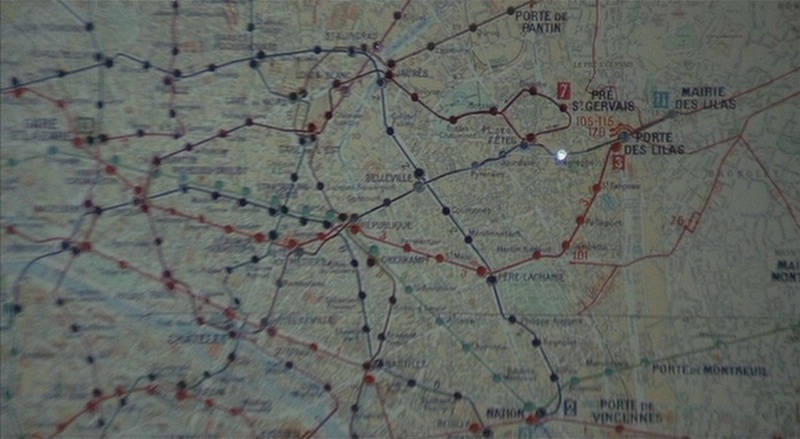 What his map doesn't show, however, is the topography of the métro beyond the actual train lines. 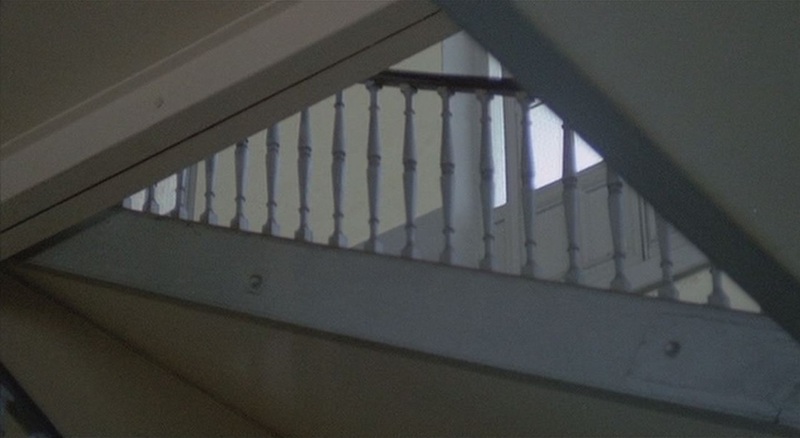 It doesn't show the stairways and corridors, nor the various entrances and exits. 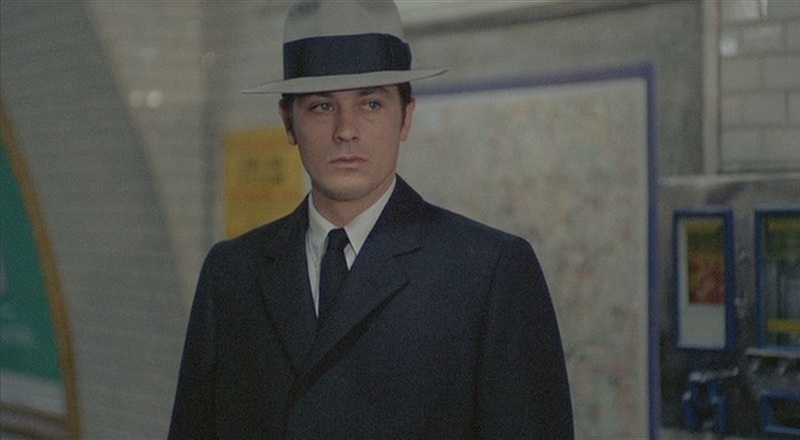 Though, as I have said, Jef's knowledge of the métro is no more impressive than that of any regular passenger who knows where they're going, at Châtelet he demonstrates a little more savoir-faire. 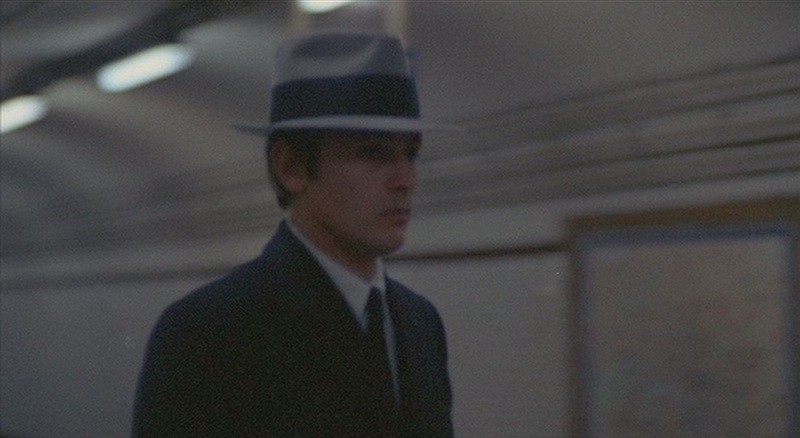 He takes the moving walkway that leads from the ligne 7 platform to the platforms for other lines. 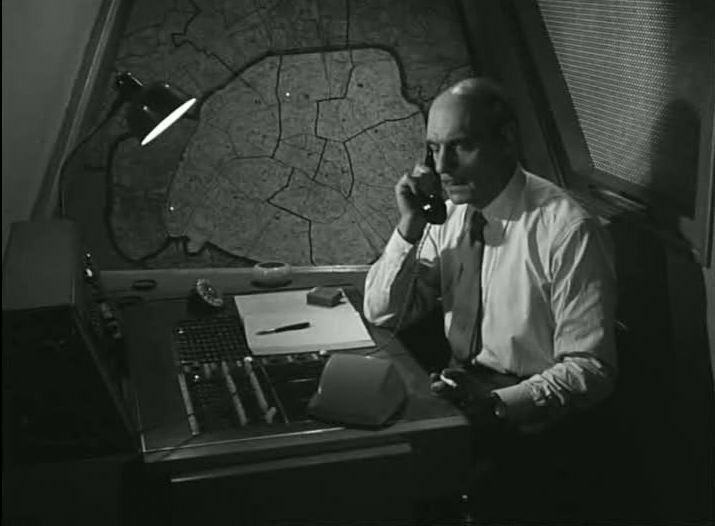 (This engineering novelty - installed in 1964 - is not on the Chief Inspector's map.) 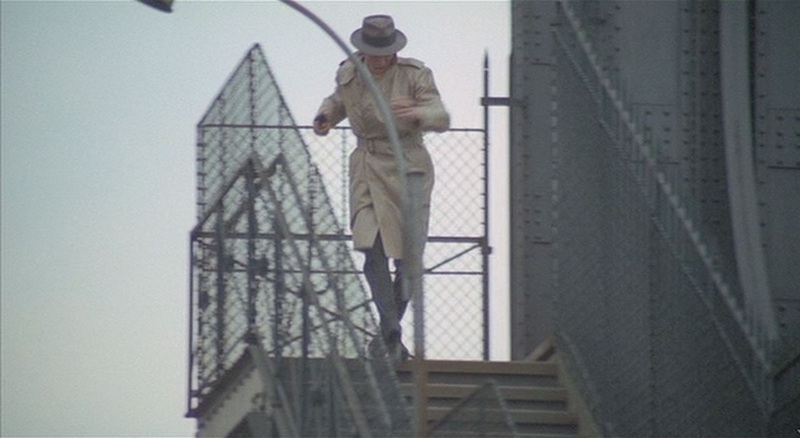 Halfway along Jef jumps from the walkway and runs back in other direction, leaving the following policewoman behind. 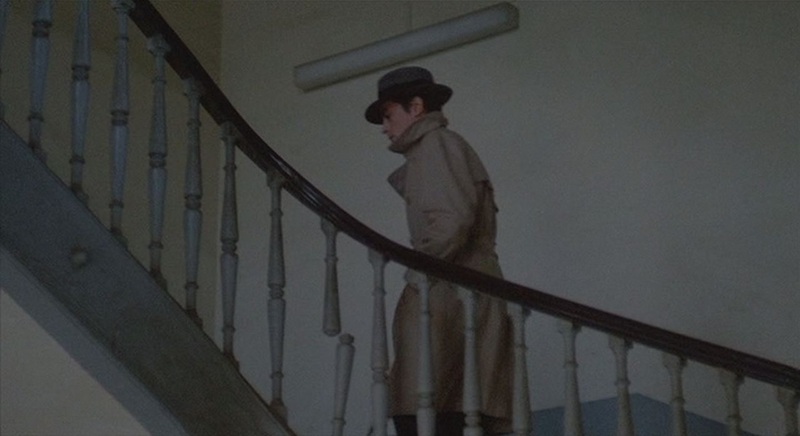 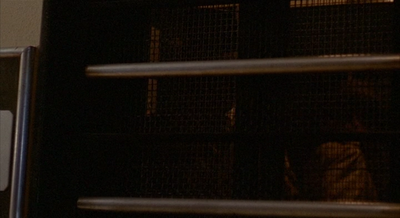 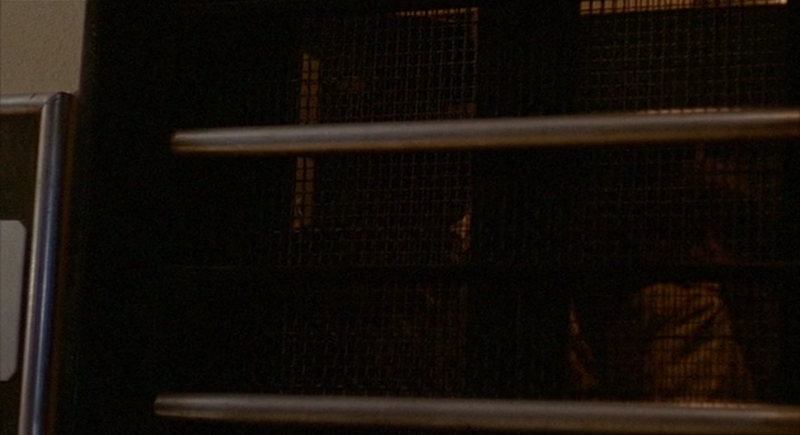 That is how he eludes the scrutiny of the Chief Inspector, watching from two levels above. 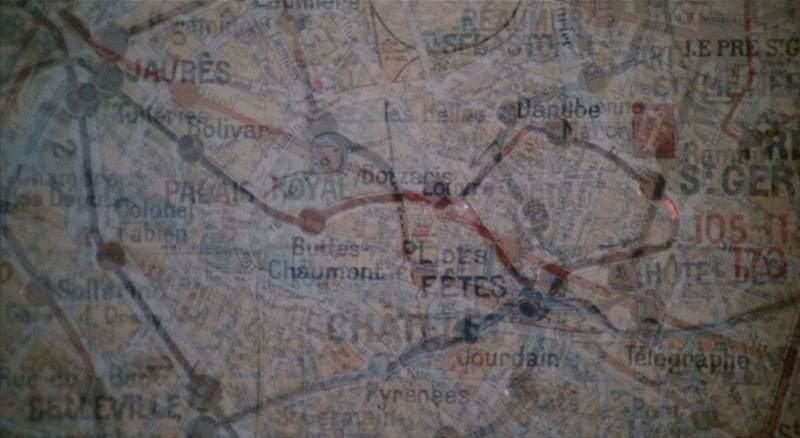 From Jef's descent into the métro at Télégraphe to his emergence at Châtelet, the sequence lasts about eleven minutes, which corresponds, roughly and ironically, to the real time this would have taken him had he gone by the direct route. 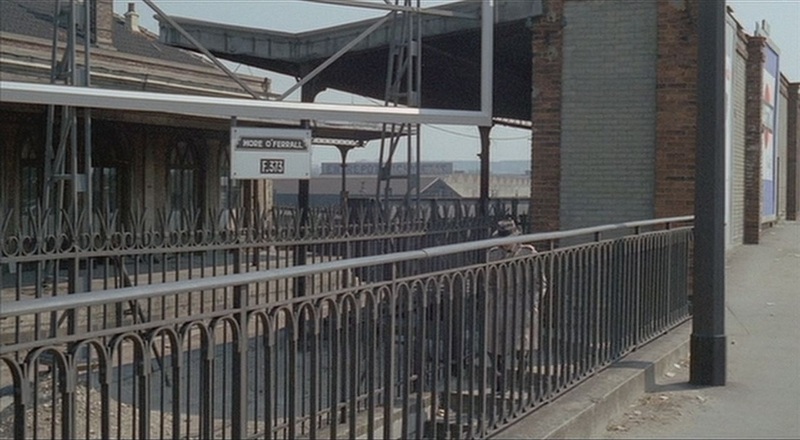 Rather than ten stops on the one line, Jef's actual journey goes through twenty-one stops with two changes. 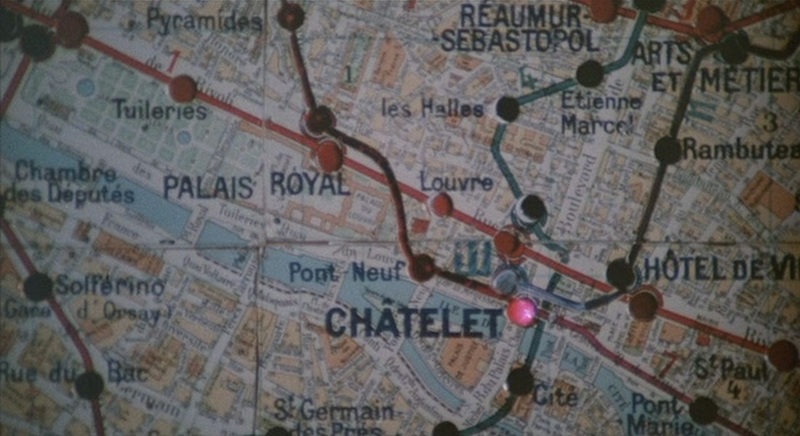 Seventeen of these stops are covered by the dissolve just before he arrives at Châtelet, leaving the earlier part of the journey shown in something like real time. 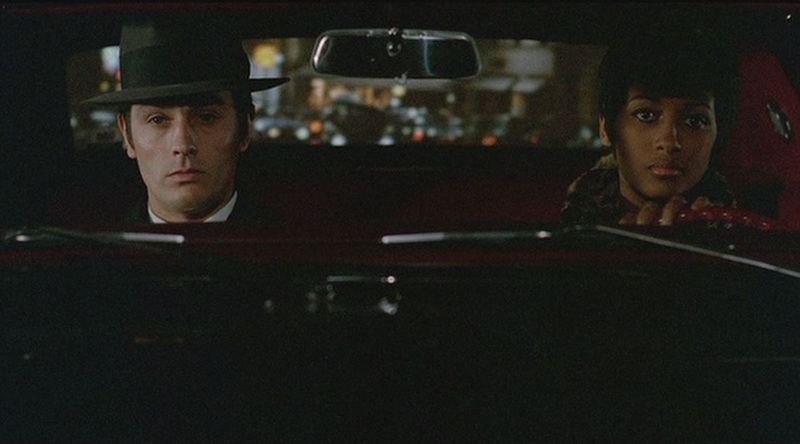 Had the film been made six months later, this journey would have been even longer. 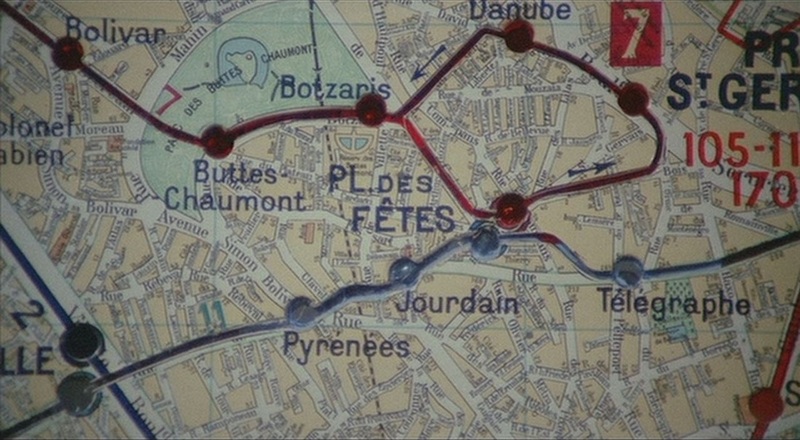 In December 1967 the section of ligne 7 between Louis Blanc and Pré Saint-Gervais, which had until then been one of two branches, was formally separated from the main part of the line (and renamed ligne 7bis), such that Jef would have had to change once more at Louis Blanc to get a train for Châtelet. 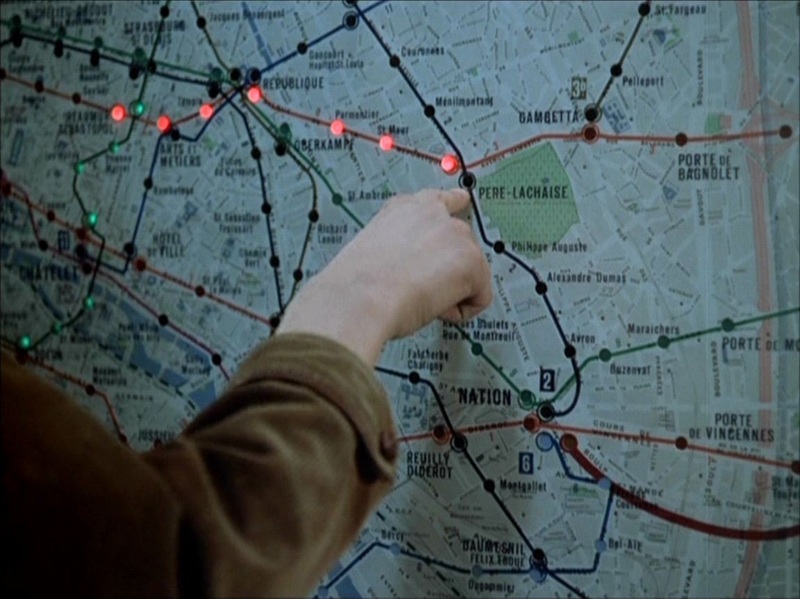 As it is, Jef's decision to switch onto the branch of ligne 7 isn't necessarily a sound one. 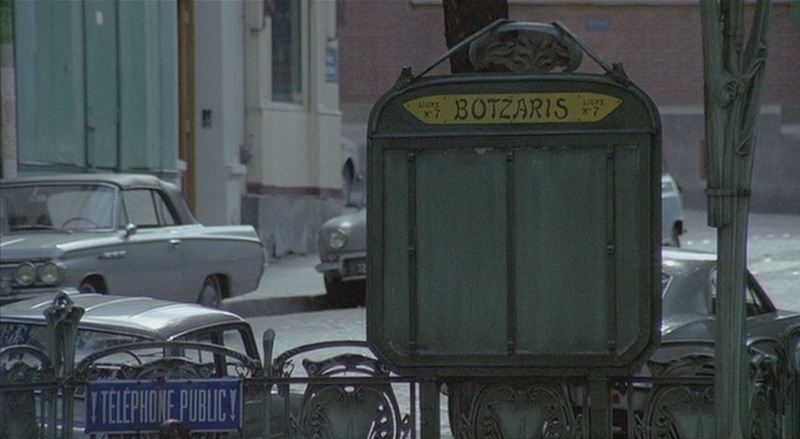 The branch has the peculiarity of becoming a single, unidirectional line after Botzaris, making a loop before heading back. 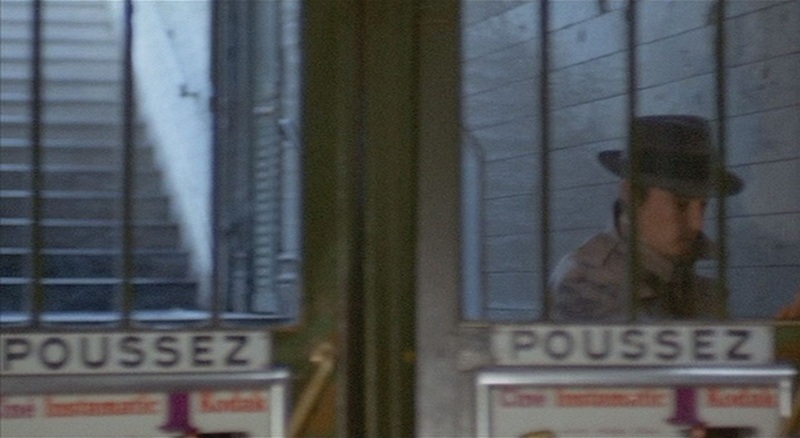 This means that if he gets off at Pré Saint Gervais or Danube he doesn't have the option of doubling back to elude his pursuer. 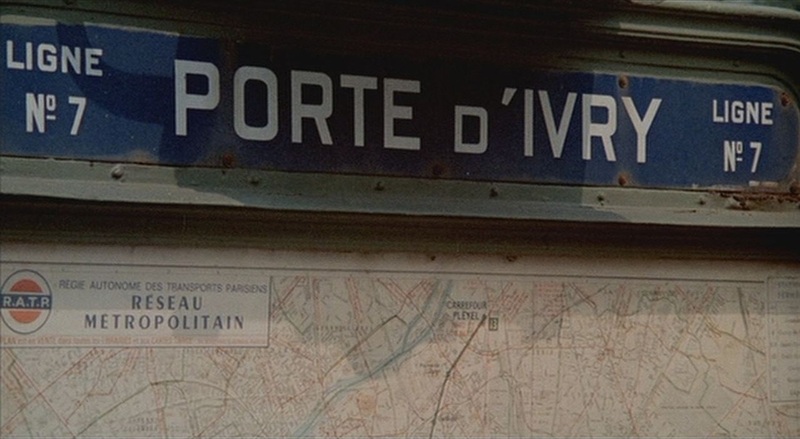 Furthermore, in taking a line that like the other goes to Châtelet, he is surely signalling that station to the police as his likely destination. 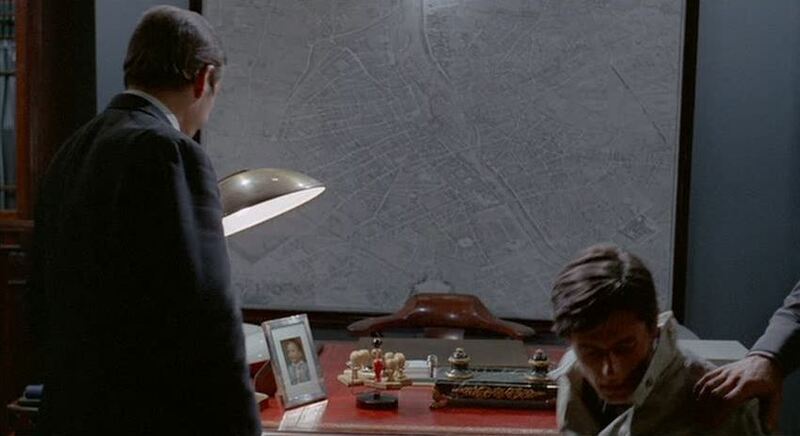 What is remarkable is not so much that Jef wins because he best knows the map, but that the police conduct this operation so incompetently as to let him get away. 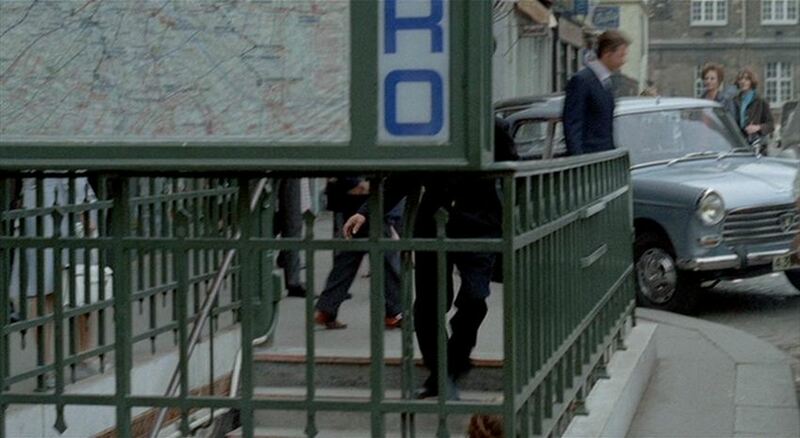 Seventy agents are deployed in the métro with more at the surface, and yet when Jef arrives at Châtelet they don't manage to cover all the exits, and Jef by chance emerges from an exit they have missed. 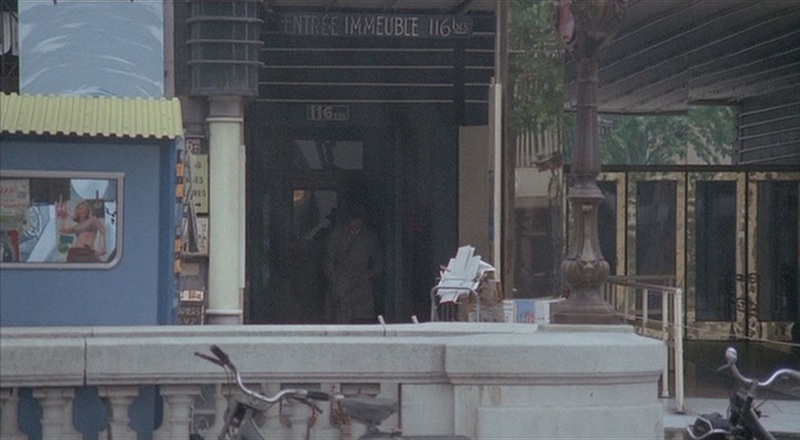 Their plan seems to have been to have cars waiting at every possible station on his journey in case he should come out there, but they might reasonably have concluded that Châtelet, with its multiple intersections and exits, needed better coverage. 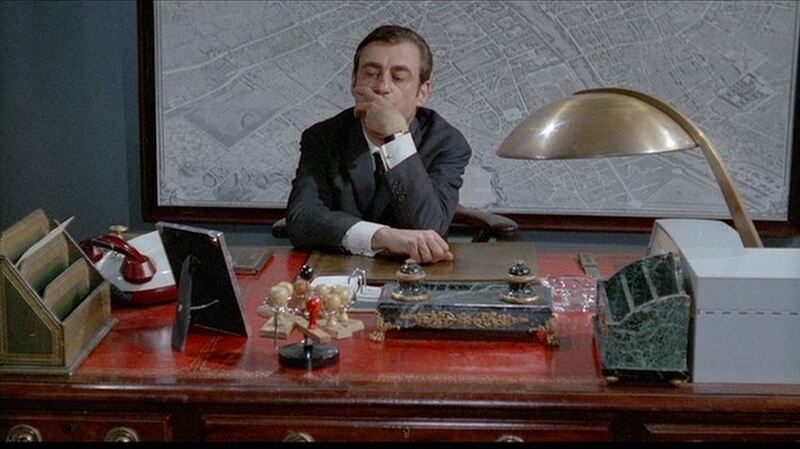 I may be being unfair to the Chief Inspector. 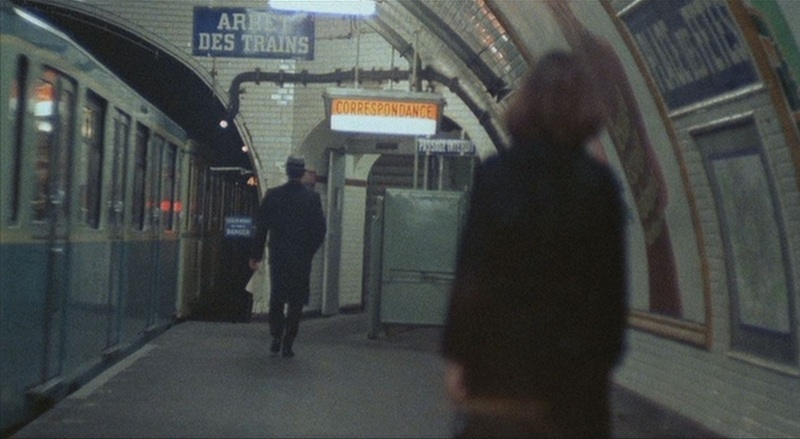 Though everything points to Châtelet as his destination, in fact Jef could have left the métro at any one of its 347 stations, since his destination was any place where he could steal a car unobserved. 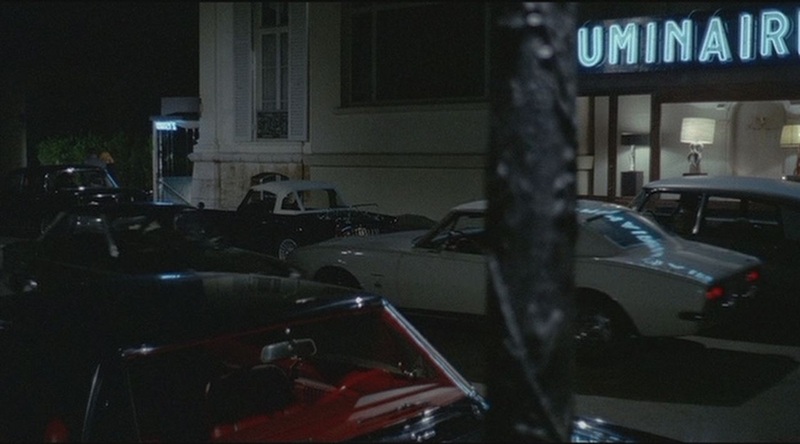 It is by chance that he came out at Châtelet, and by chance that he eluded the police there. 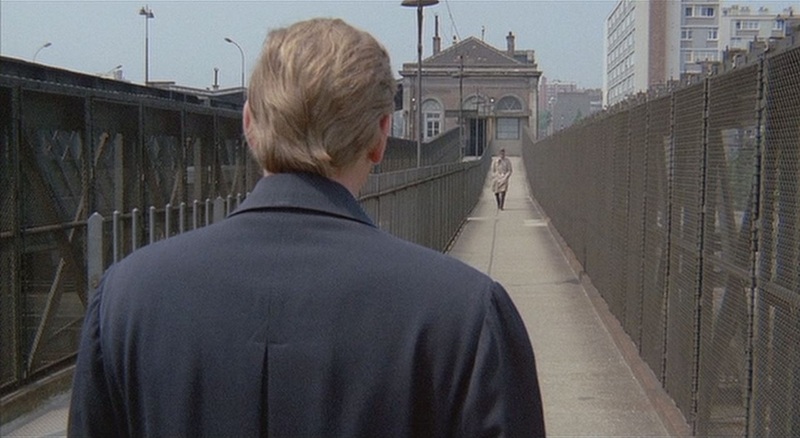 Though the endpoint of his first métro journey, this elevated position is the antithesis of the métro - trains pass beneath the two men as they meet. 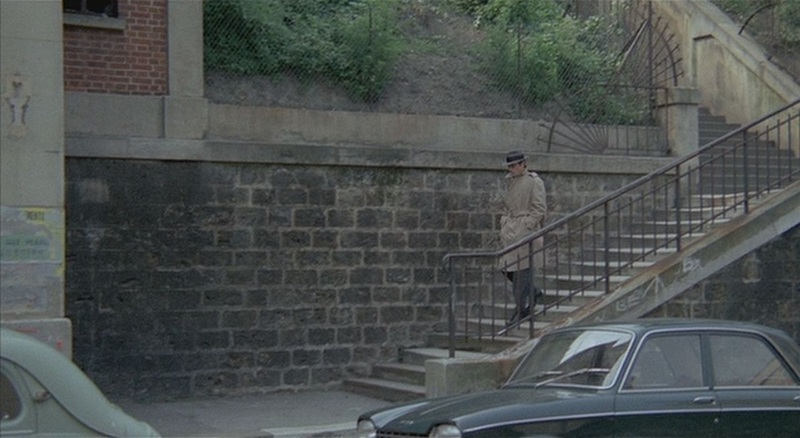 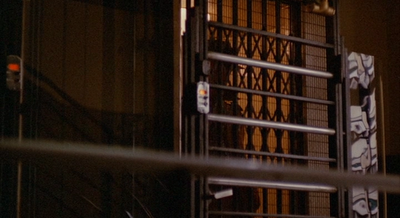 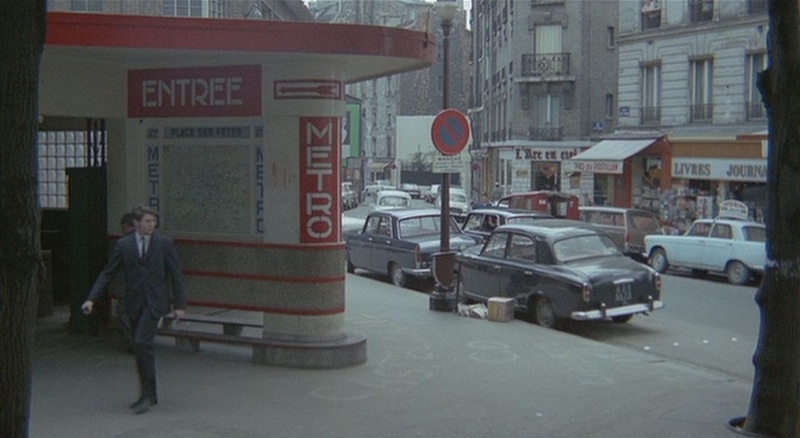 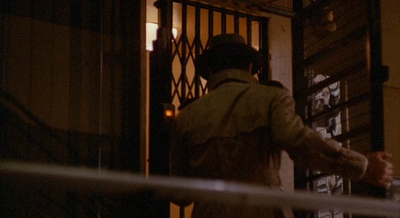 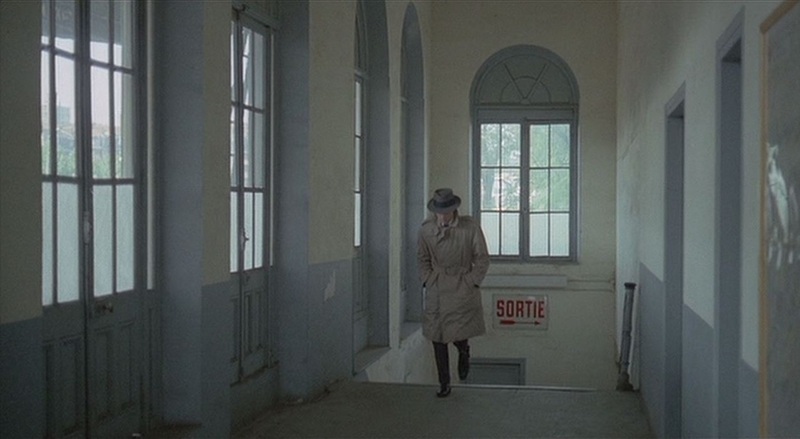 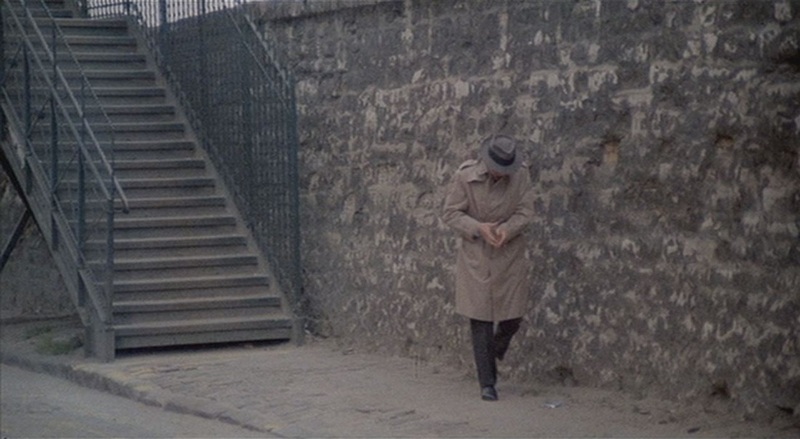 Excepting the fourth-floor corridor that links the two lifts by which Jef earlier eluded a a tailing policeman, this is the most elevated place in Le Samourai, a film that stays mostly at or below street level (compare with the Belmondo vehicle Peur sur la ville, here, a film that also has a chase in the métro but which spends most of its time looking down on the city from very high up). 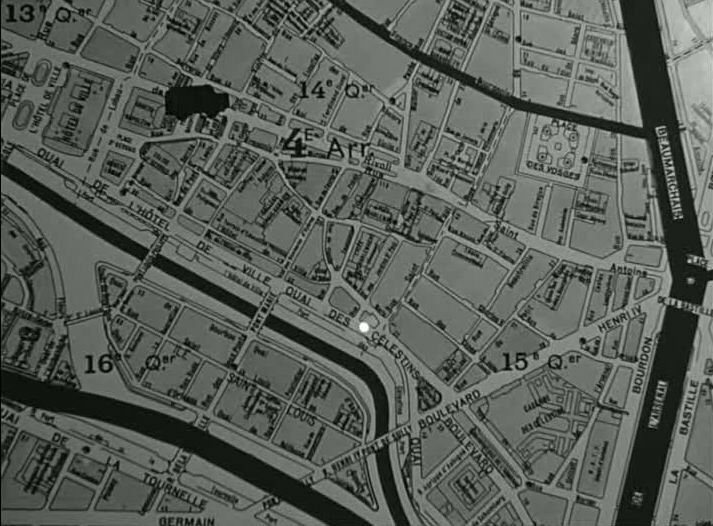 This conclusion to Jef's journey is like a straight line drawn across the map. 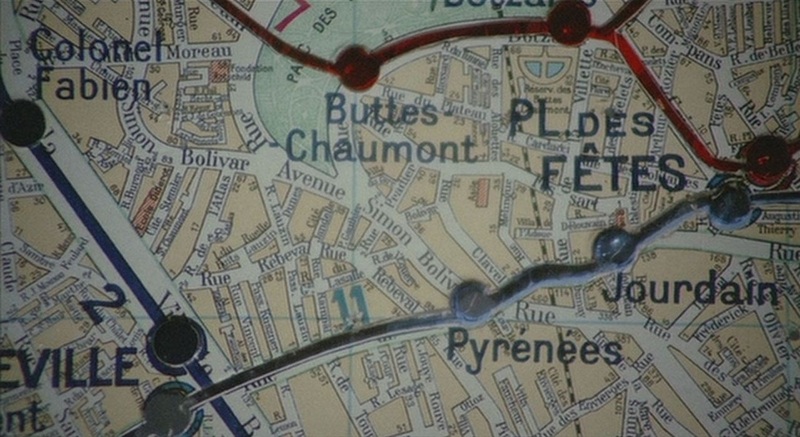 The choice to adapt only the part of the map that relates to the story is understandable, but we might here ask why it is this part of Paris that was given a place in the story in the first place. 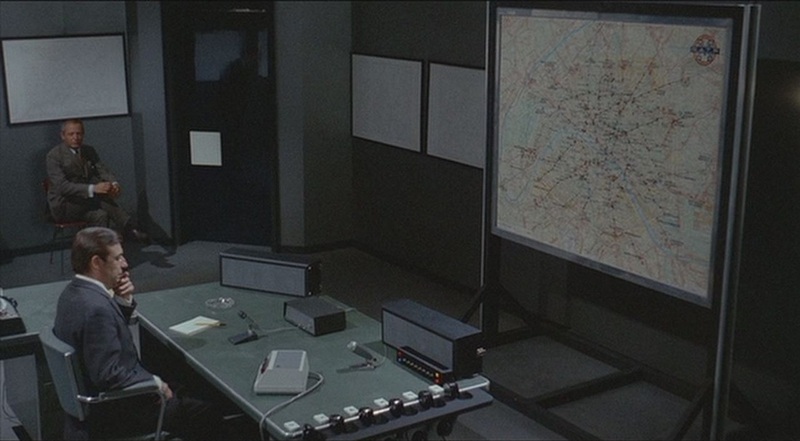 A clue may lie in the method of surveillance deployed in this sequence, tracking Jef with 'gallium arsenide transmitters' . 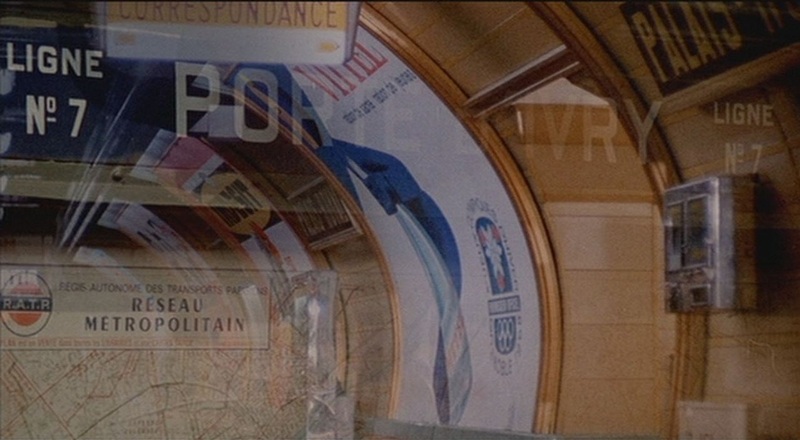 An ancestor of this modern technology is signalled in the name of the station at which Jef descends into the métro: 'Télégraphe'. 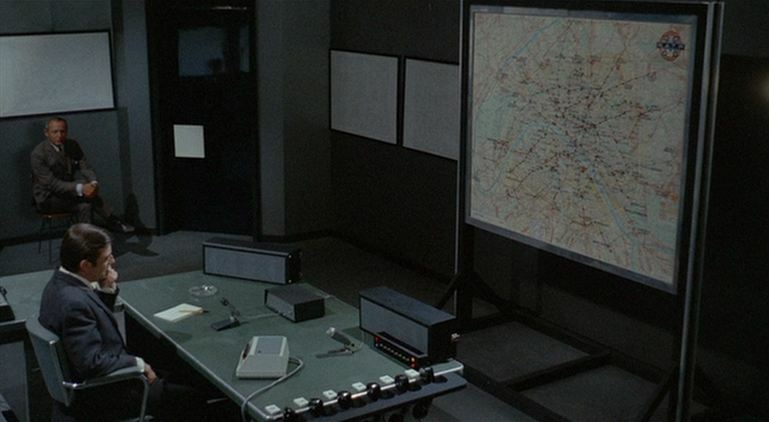 This place name refers to Claude Chappe's telegraphic system, installed in the vicinity in the 1790s. 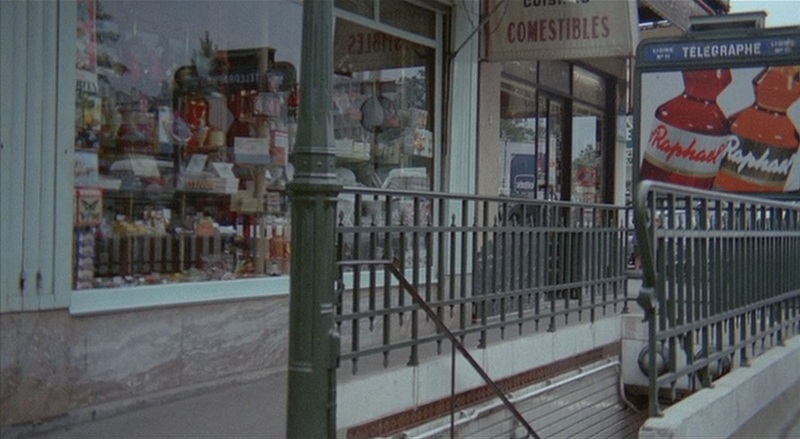 It is possible that this part of Belleville was made central to the film's topography solely in order to make this connection between two technologies across two centuries. 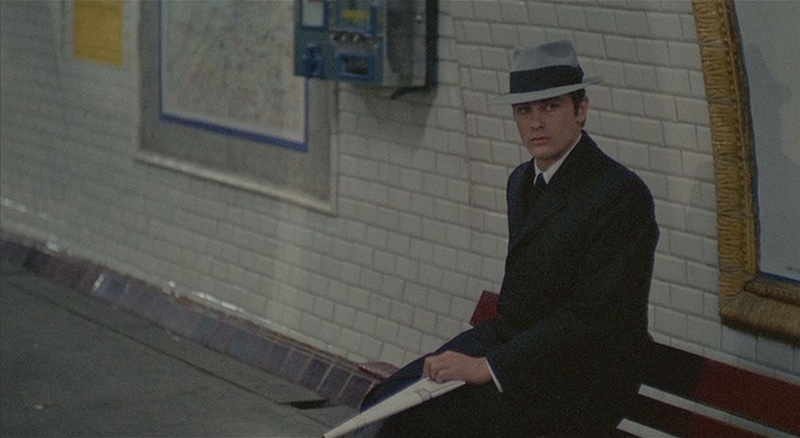 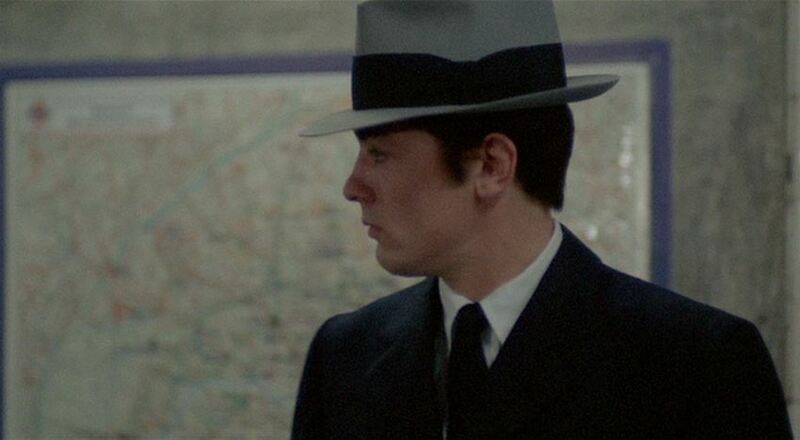 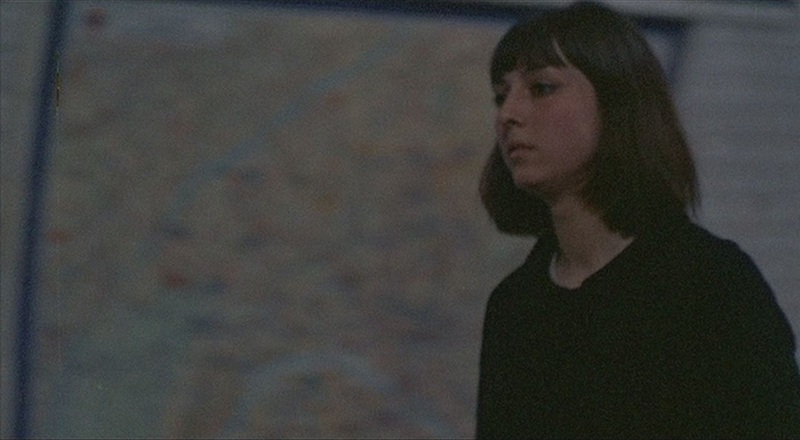 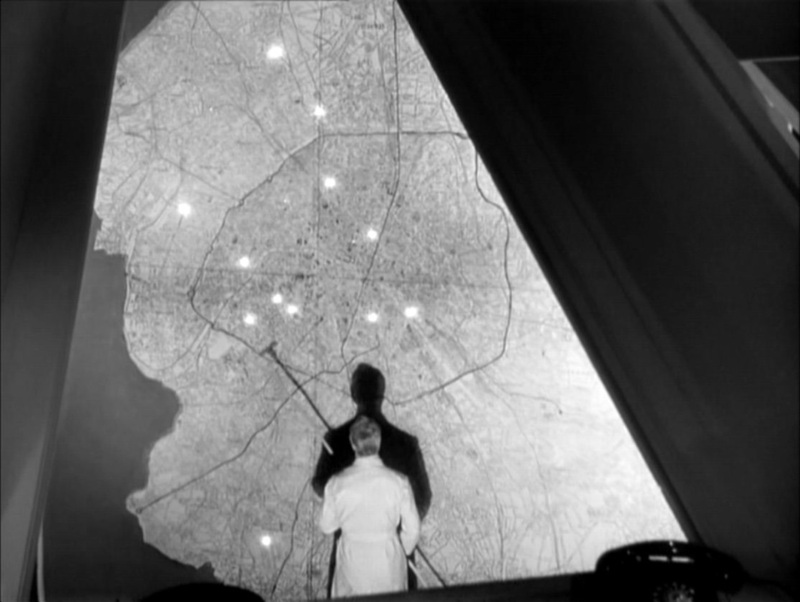 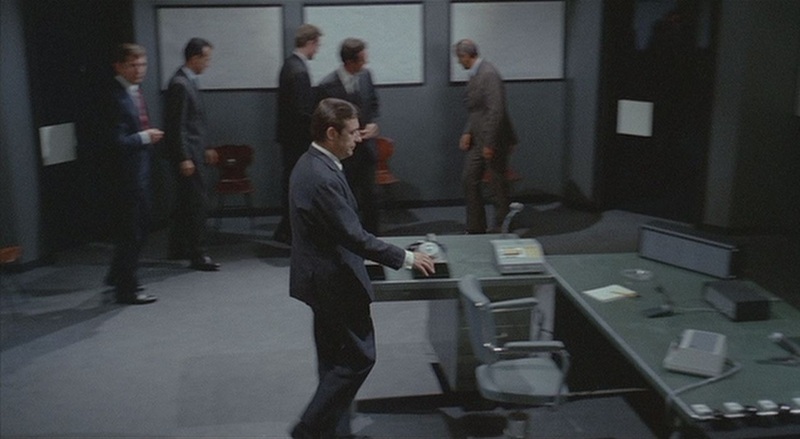 I agree with Giuliana Bruno that Melville's film is a lesson in cartography, but would be reluctant to concur that 'ultimately Le Samourai tells no other story than that of the subway map of Paris', because the configuration of that map in this film is not in any sense a story. 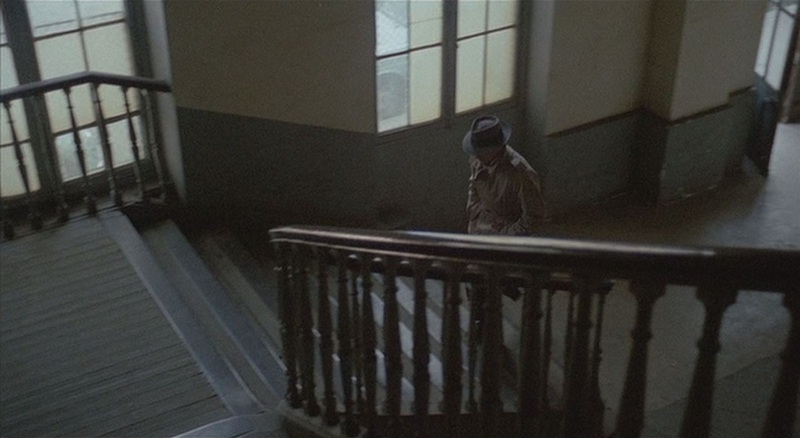 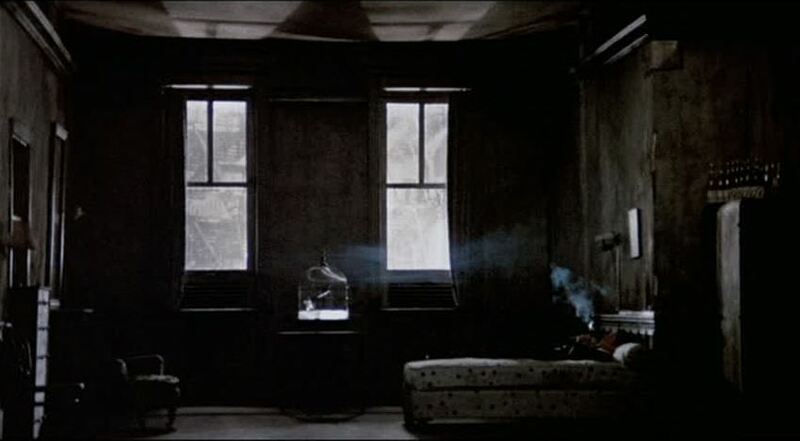 The maps in Le Samourai, alongside its staircases and window frames, its car journeys and train rides, its zooms and pans - and that wonderfully strange, almost imperceptible back and forth movement of the camera in Jef's room, just after the credits, when you're not sure if it's you rather than the film that is wavering - and so much else, all these are readings of space, simply. 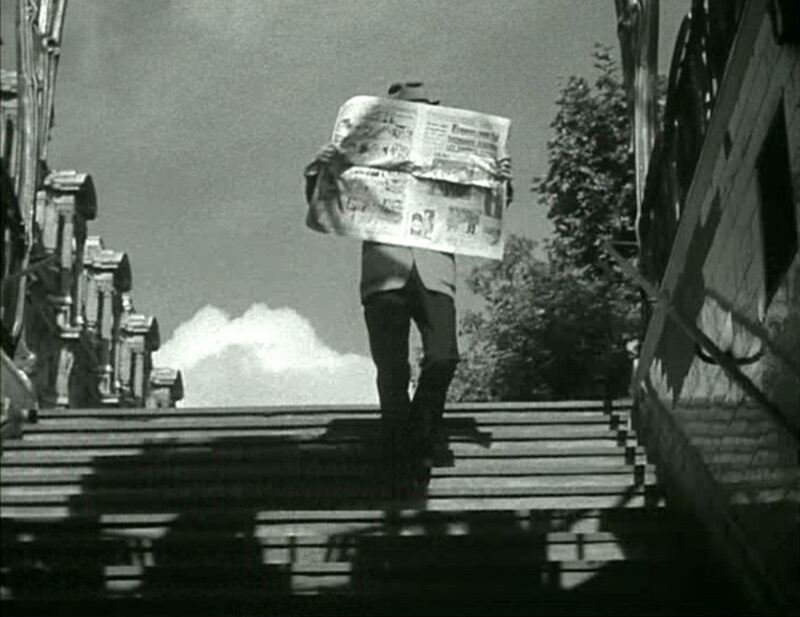 Who needs a story?